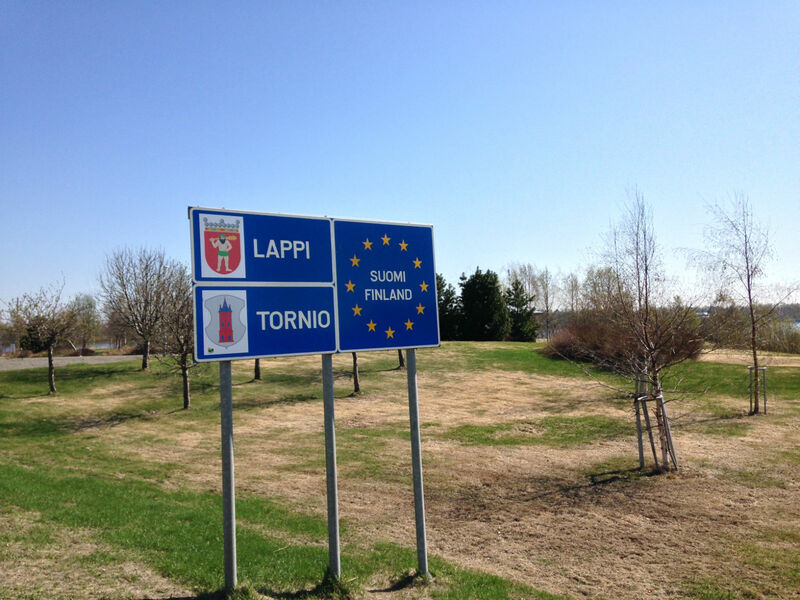 21 May, 2014 – We start in Luleå and drive to Haparanda, to then cross the border into Finland. 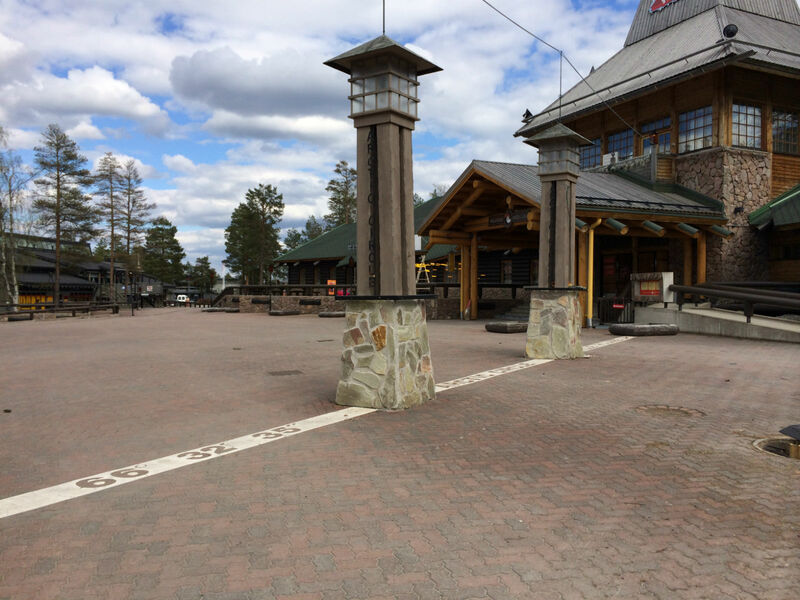 In the border town of Tornio, we stop at the first shopping center to get a Finnish prepaid data card. Super-fast and uncomplicated, we are back online. 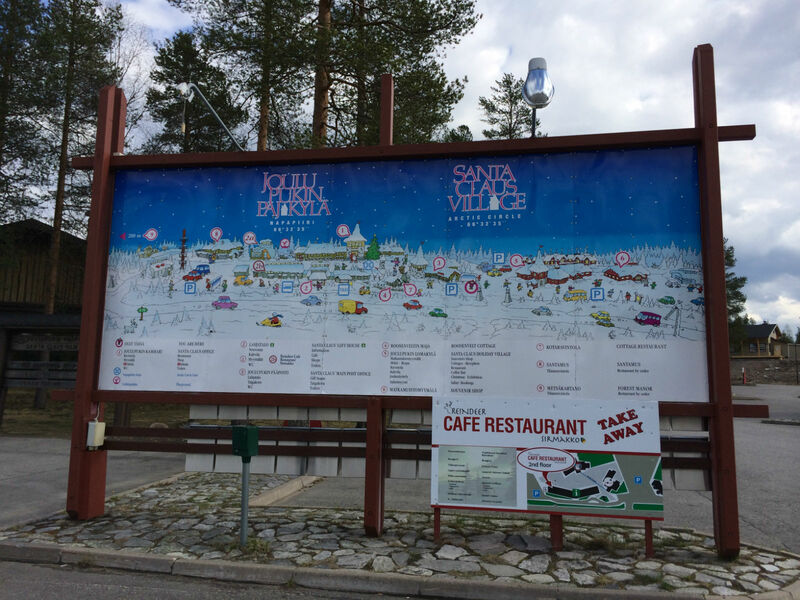 Then quickly on towards Rovaniemi, as we have a date near the Arctic Circle with Santa Claus! 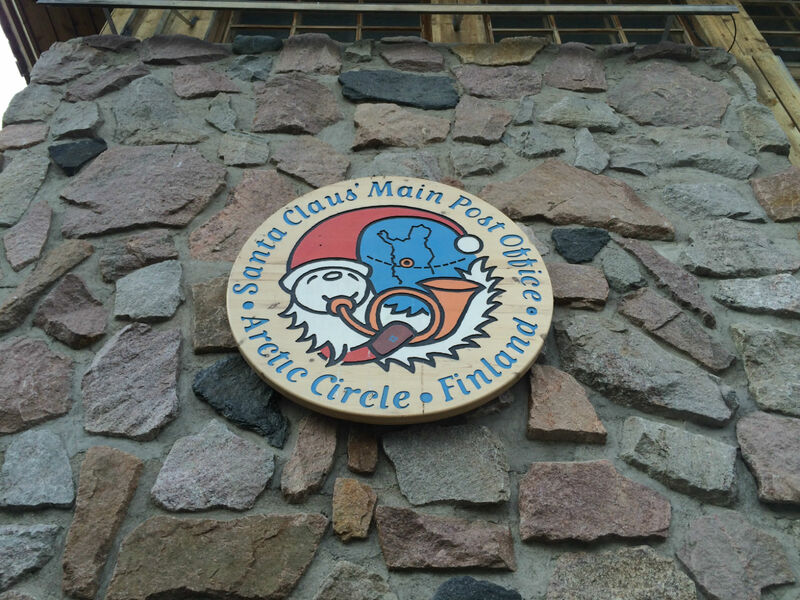 🙂 In the Santa Claus Village, north of Rovaniemi, Santa awaits us, with a number of souvenir shops, the Office of Santa Claus and the Post Office. 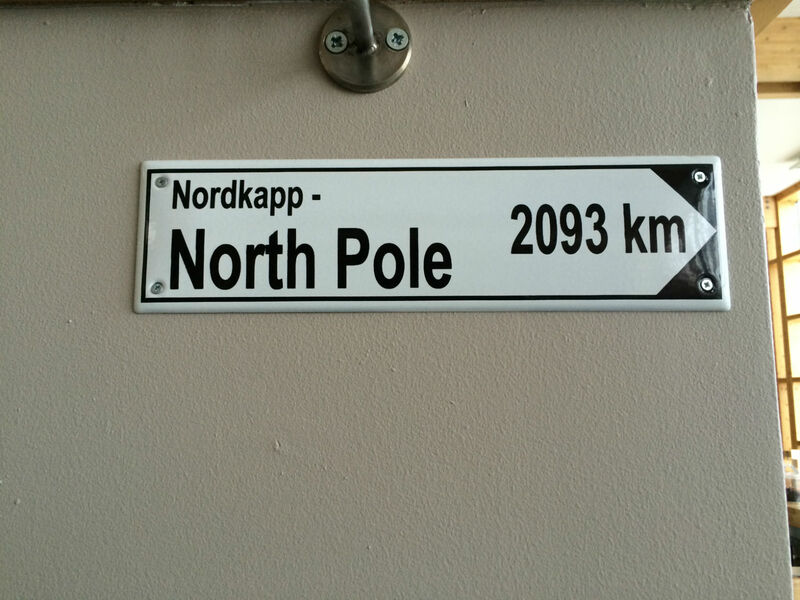 A big “Santa Is Here” sign shows us where we can find him. 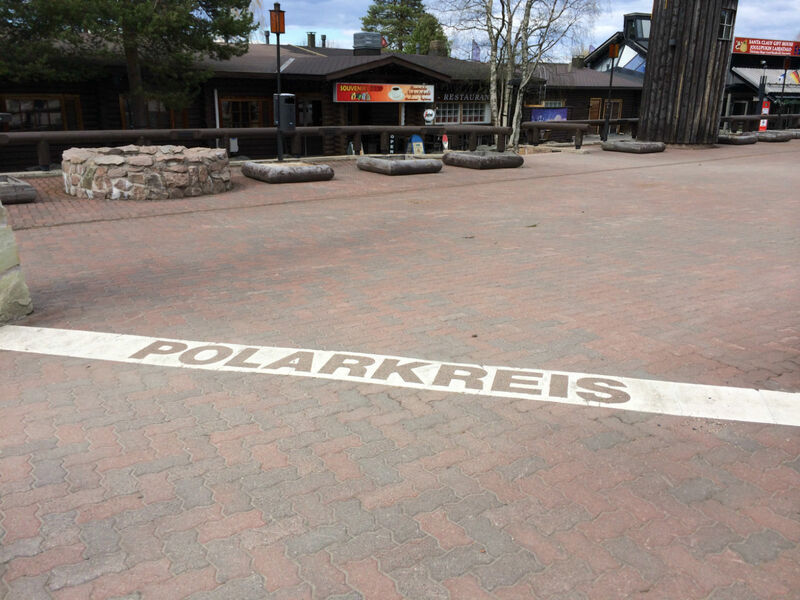 So we enter Santa Claus’ office and inside, follow an imaginatively designed path that will lead us to Santa. 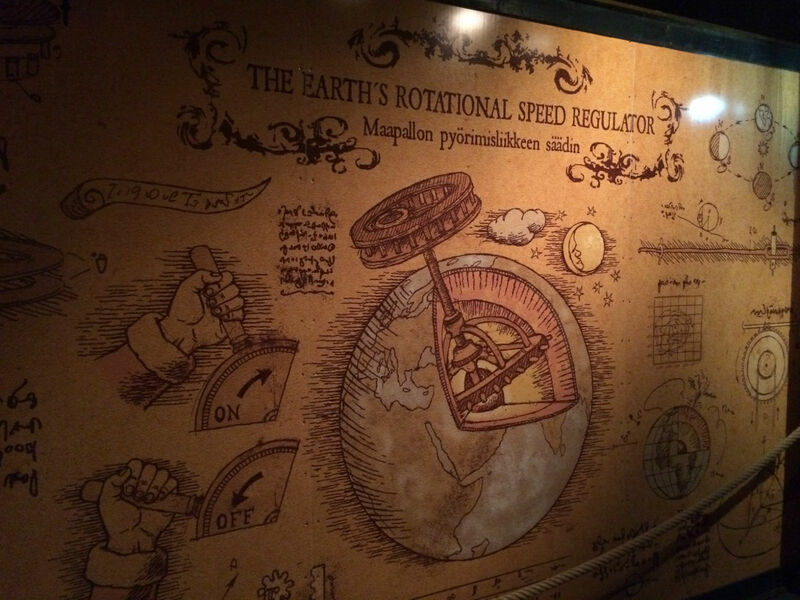 Along the way, we also get to see the several stories high “Earth’s Rotational speed regulator”, with which Santa Claus, on Christmas Eve, stops the world to be able to bring gifts to all the children. Of course, everything is laid out very “touristy” and thanks to the wonderful design you get a bit of Christmas spirit in May. 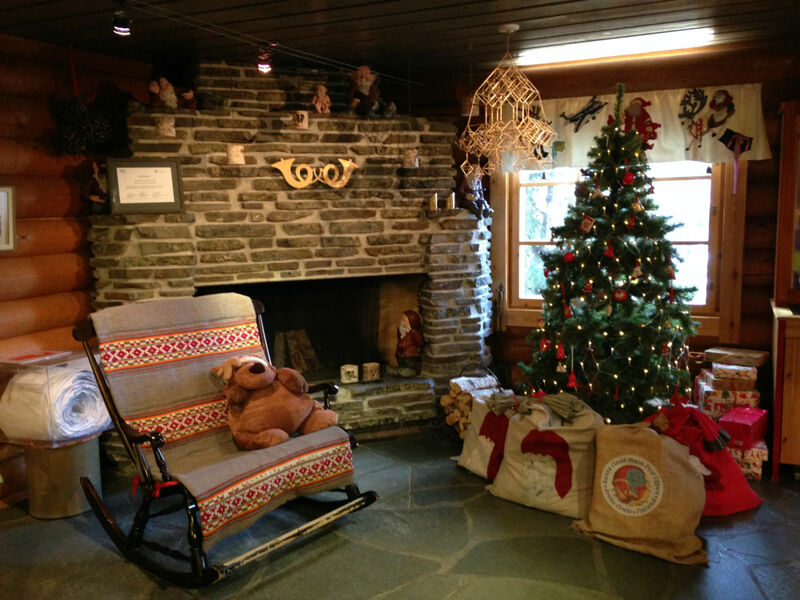 Santa even greets us in German – of course he can speak every language – and talks to us about our onward travel plans. 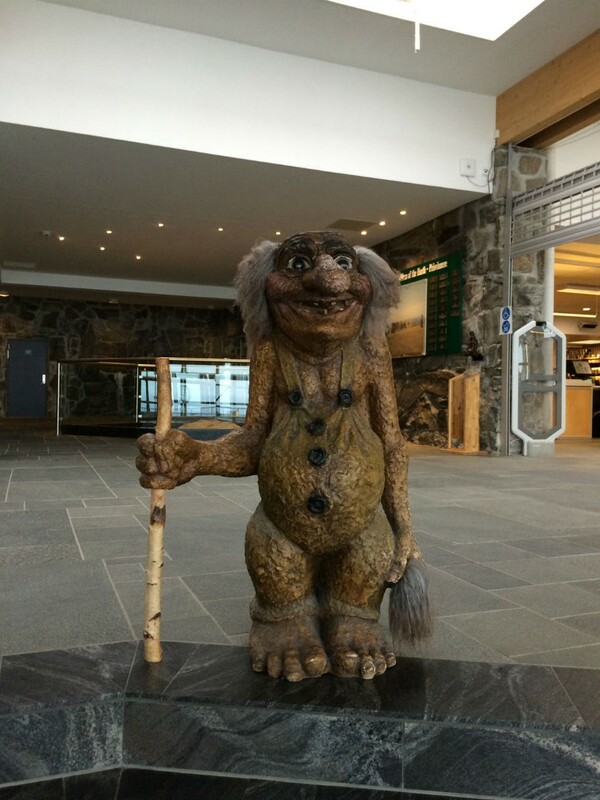 Our youngest traveler, at 5 months, is unfortunately still too young to know that she has just visited one of the main heroes of her childhood. 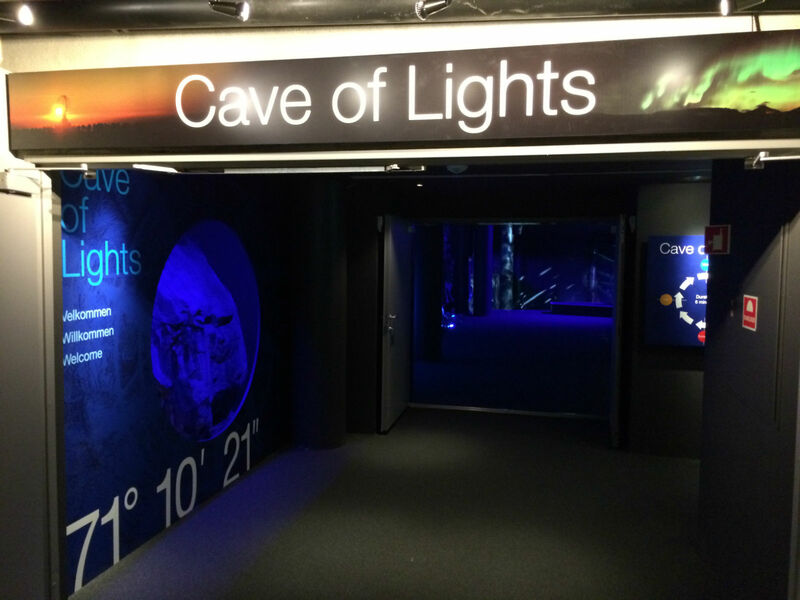 But for children in the “right” age it is most certainly a wonderful experience. In the high season in summer and in winter, there is also an amusement park here. 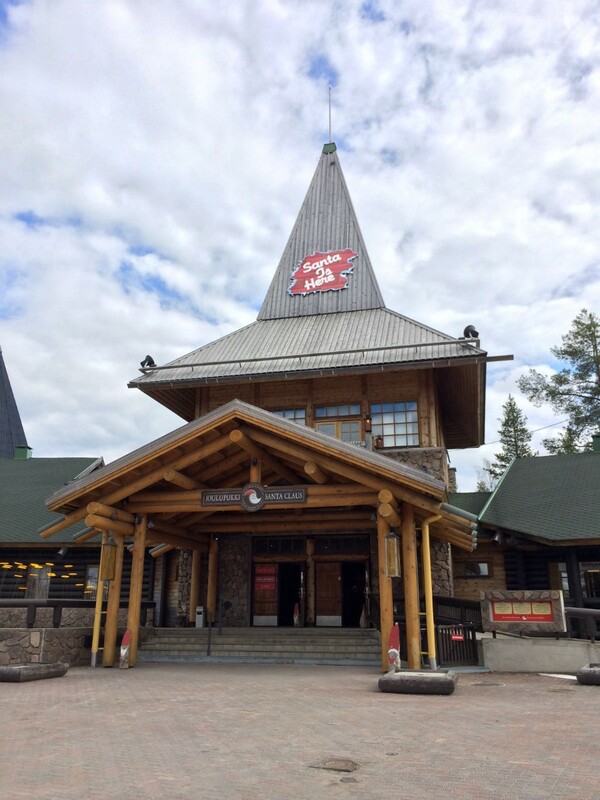 Attention: to the right of Santa Claus Village is the Santa Claus Holiday Village. 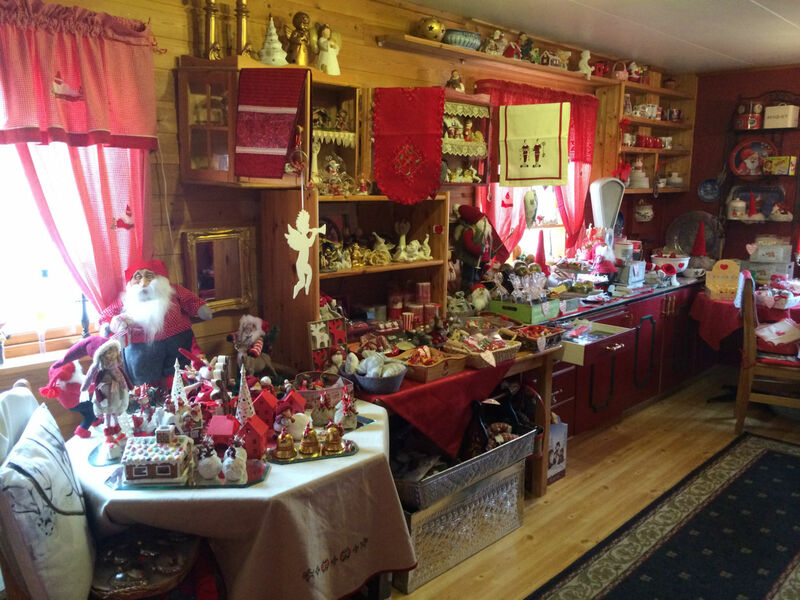 In a large souvenir shop, a long corridor also leads to a Santa Claus, with whom you can take pictures. 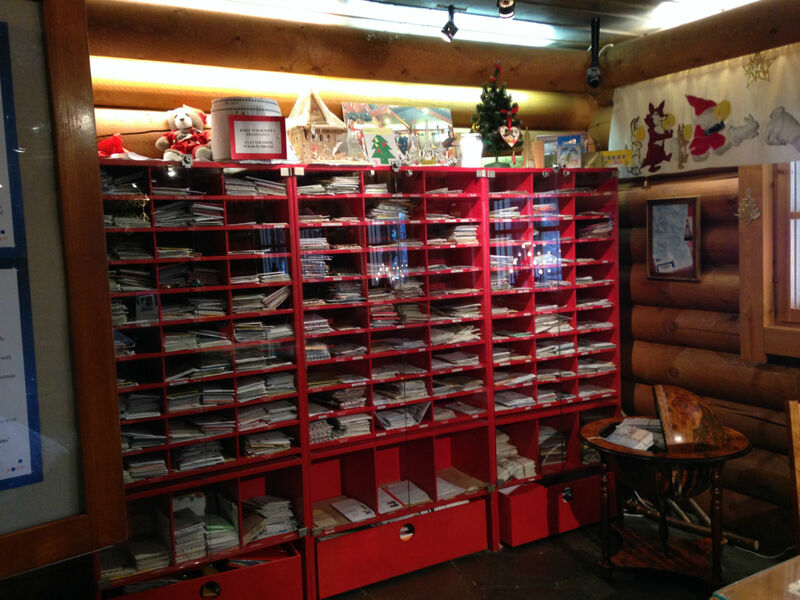 The more impressive and beautifully “originally” decorated one, can however be found left, in the Santa Claus Office, of Santa Claus Village. 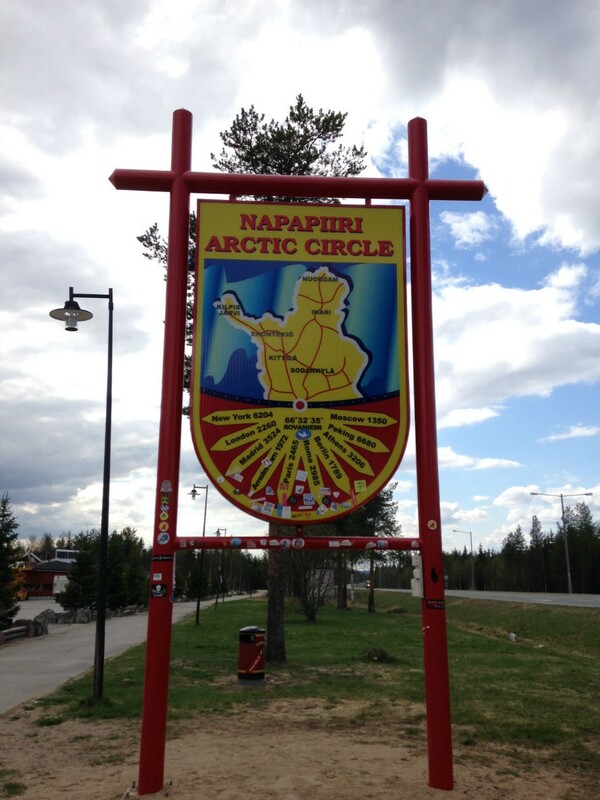 Then we also pick up our Arctic Circle certificate. 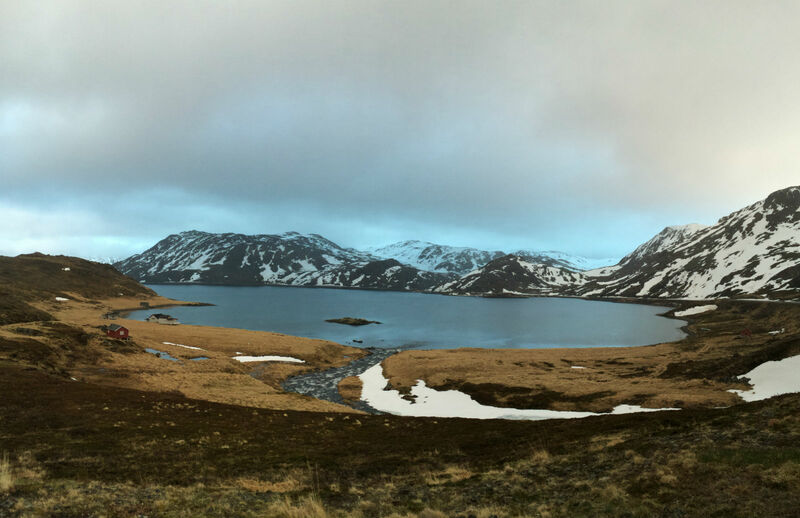 That we have come closer to the Arctic Circle, is already more evident, as the nights are getting shorter and lighter. 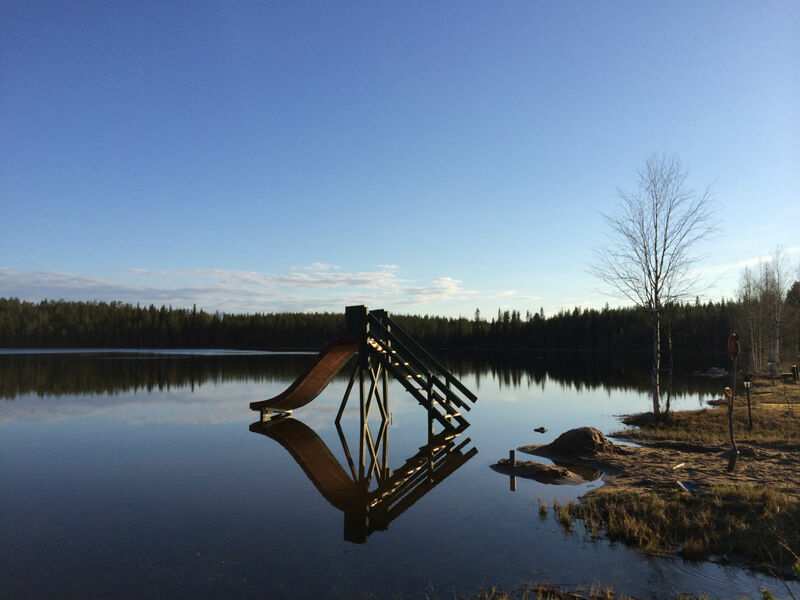 From now on we will also be able to enjoy the midnight sun. 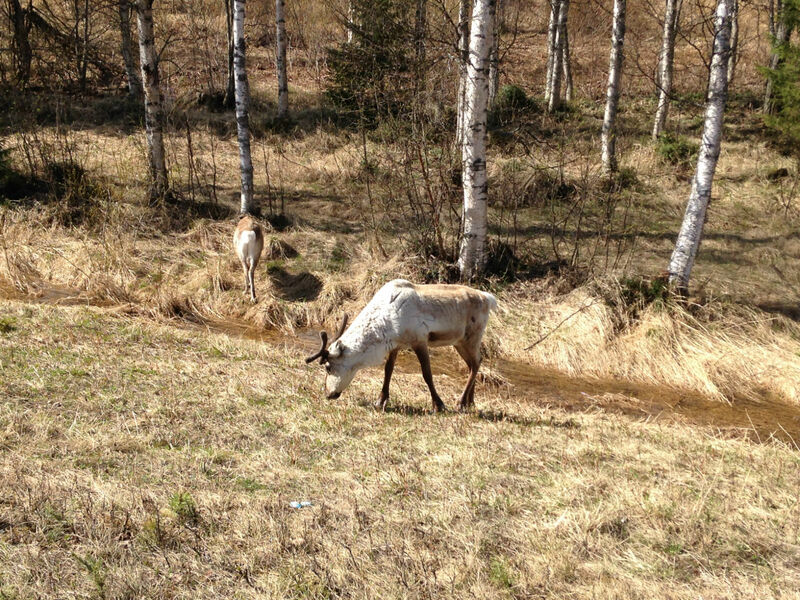 We follow the E75 towards Sodankylä and see reindeer for the first time on the roadside. 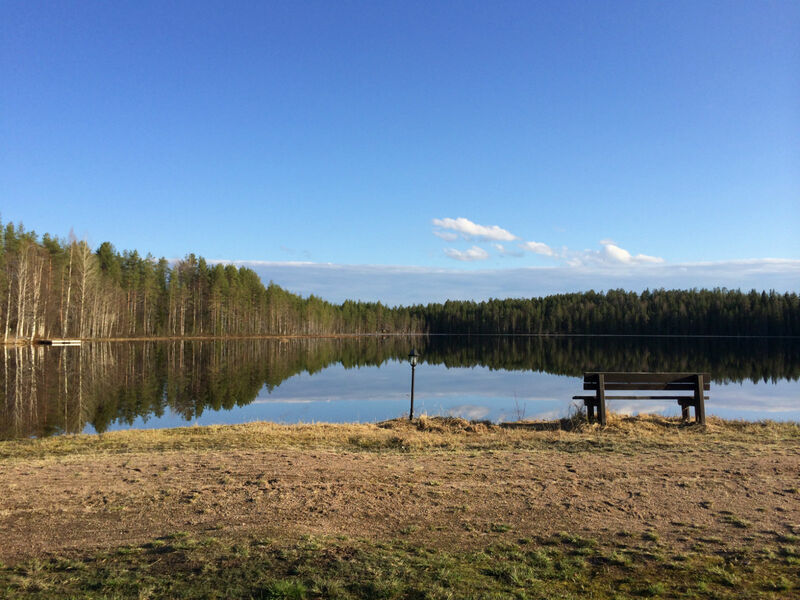 We turn directly from the E75 into a campsite, which is located on a small lake. Actually, the campsite is still closed, nevertheless, we are allowed to stay, we get electricity and even a hut is opened for us in which we can use the bathroom. We cook pasta with tuna and eat overlooking the lake. Then we try to walk a lap around the lake. 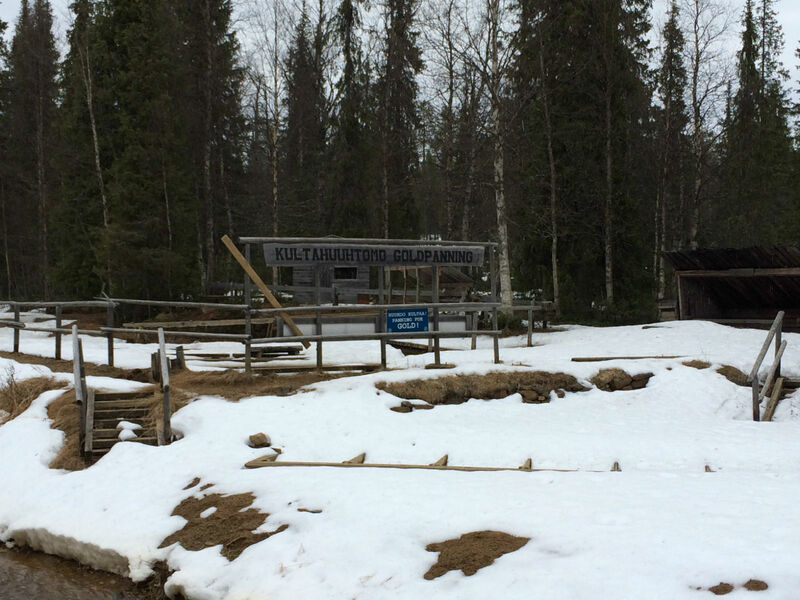 You can tell that there has been, until recently, snow laying here and the winter season has only just come to an end. 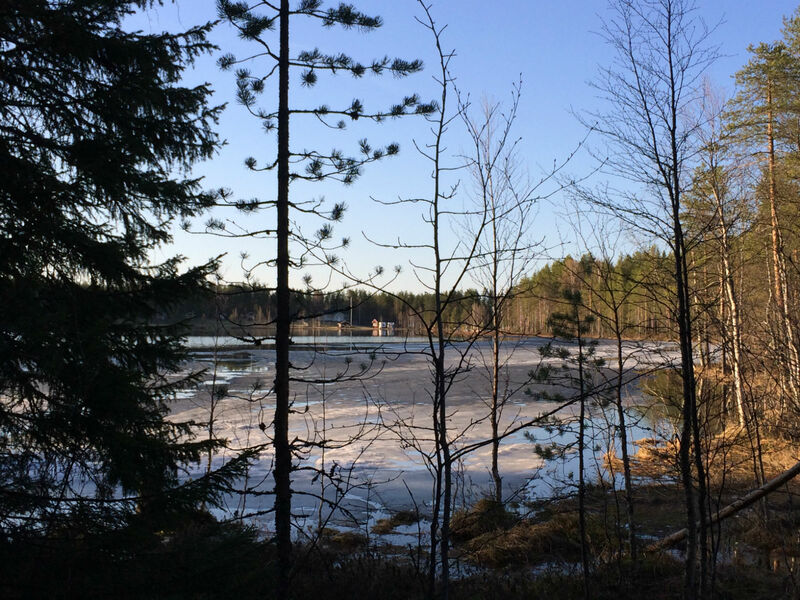 Dog sleds and cross-country skis are still lying around; some parts of the lake are also still covered with ice. 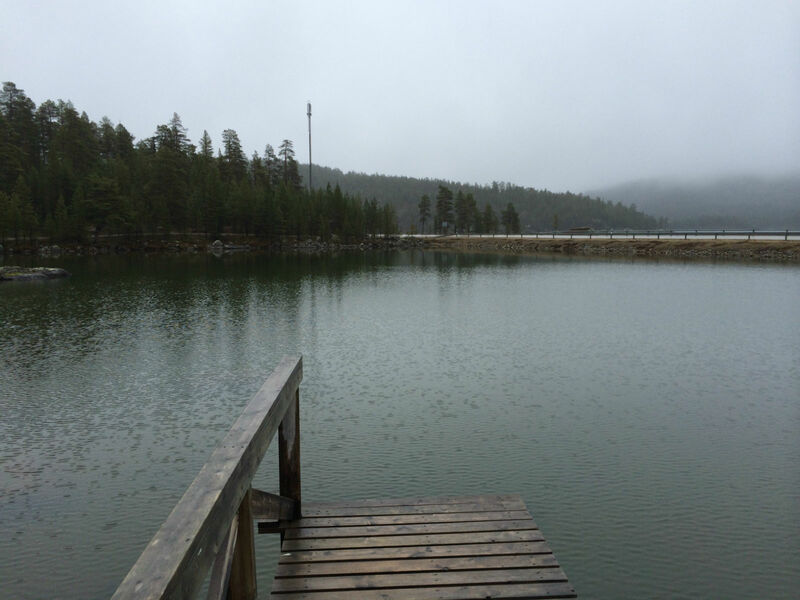 We quickly get wet feet, because condensation water seeks its way into the lake and so we make our way back. 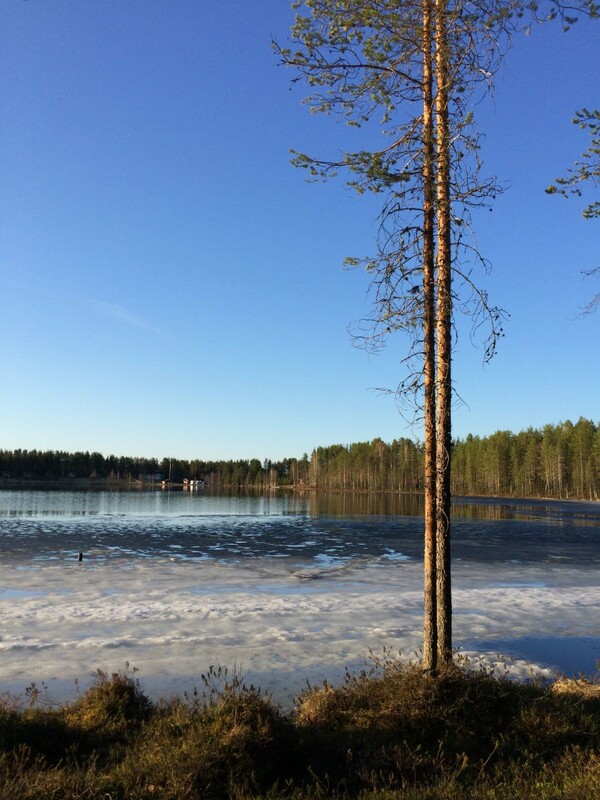 Here we get the idea to return once more to Lapland during winter: snow-covered landscapes, driving around by snowmobile, dog sledding, sauna and cozy evenings sitting by the fireplace. 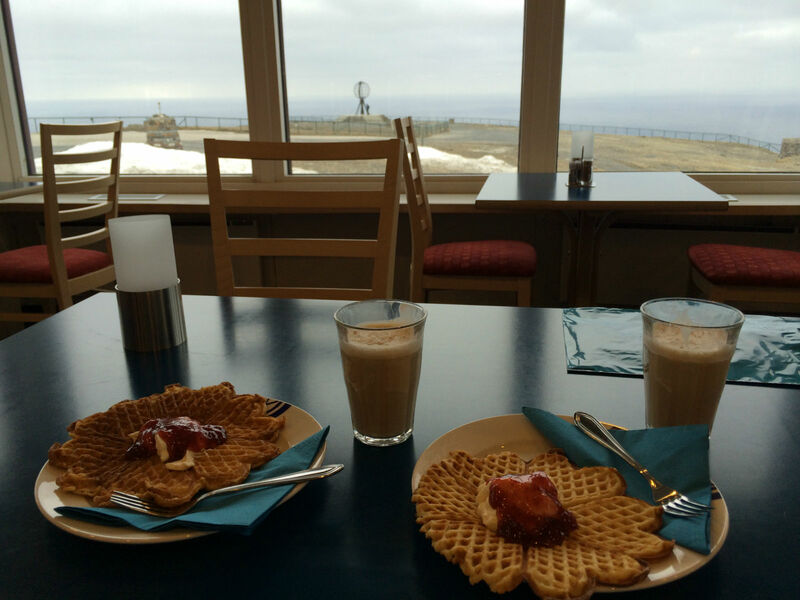 22 May, 2014 – The next morning we brave the windy weather and have breakfast in the fresh air. 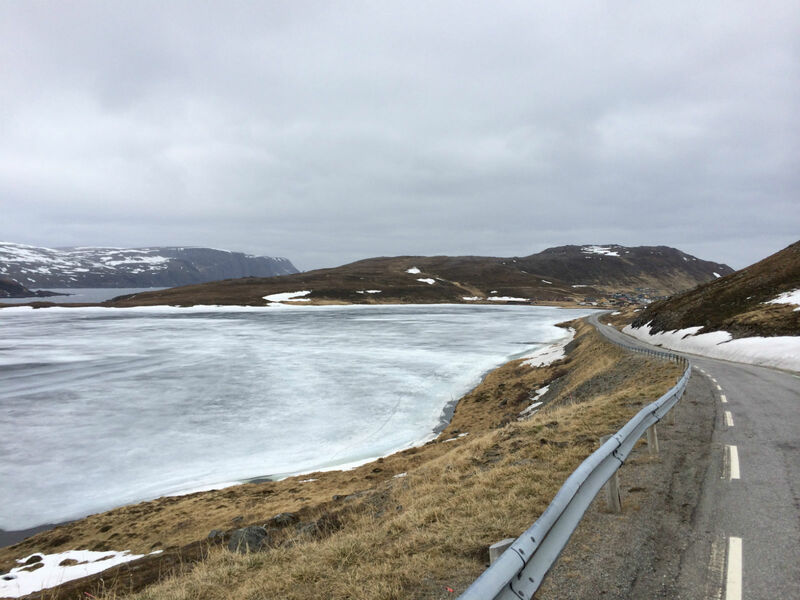 The further north we go the more the temperature drops. Logical. We will therefore not get the opportunity to eat outside often. 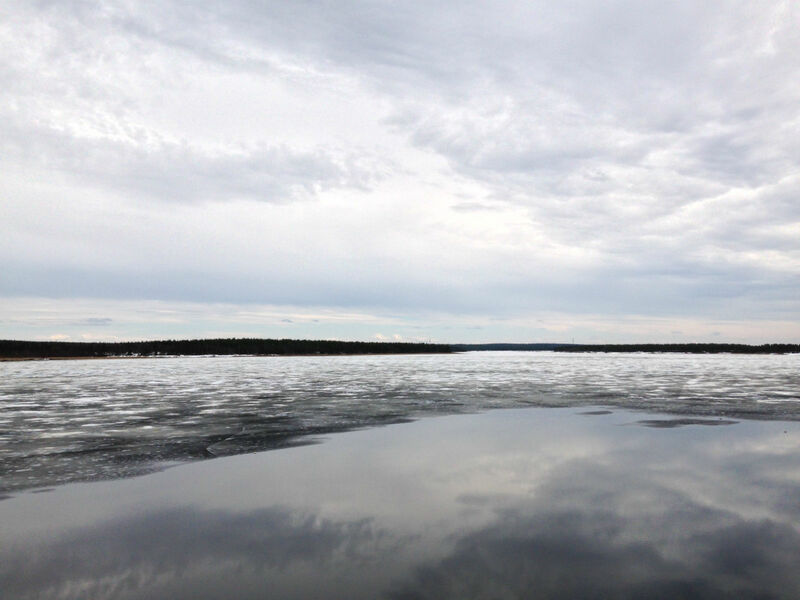 The goal for today is the city of Inari at Lake Inari and the outlook here is no longer so rosy. 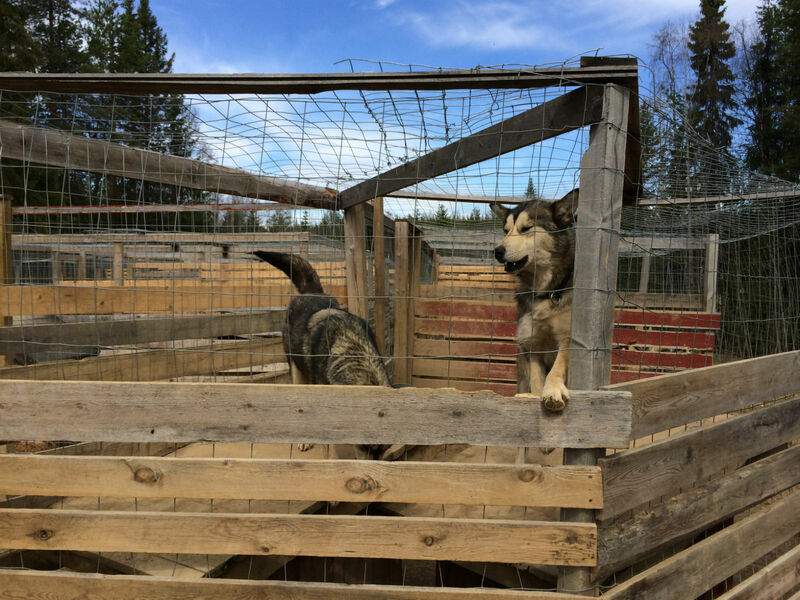 Before departing our campsite, we still take a look at the Husky Farm, which is located right next to the campsite. 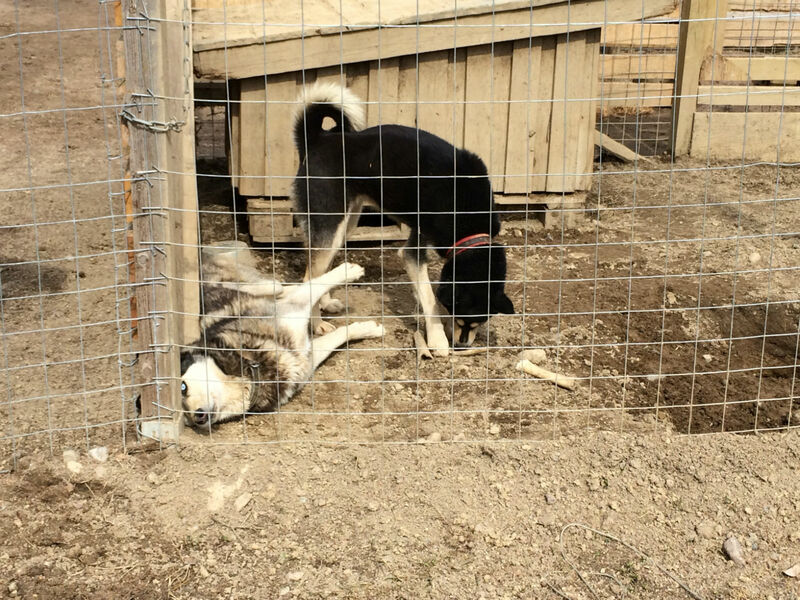 So many dogs in such a small area, we find a bit strange. 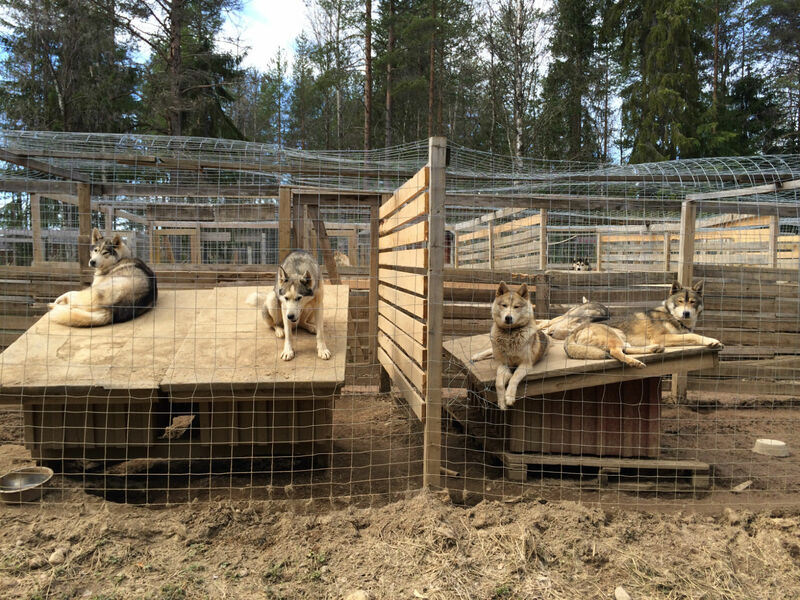 But you have to consider that the Huskies here are seen and kept as livestock. 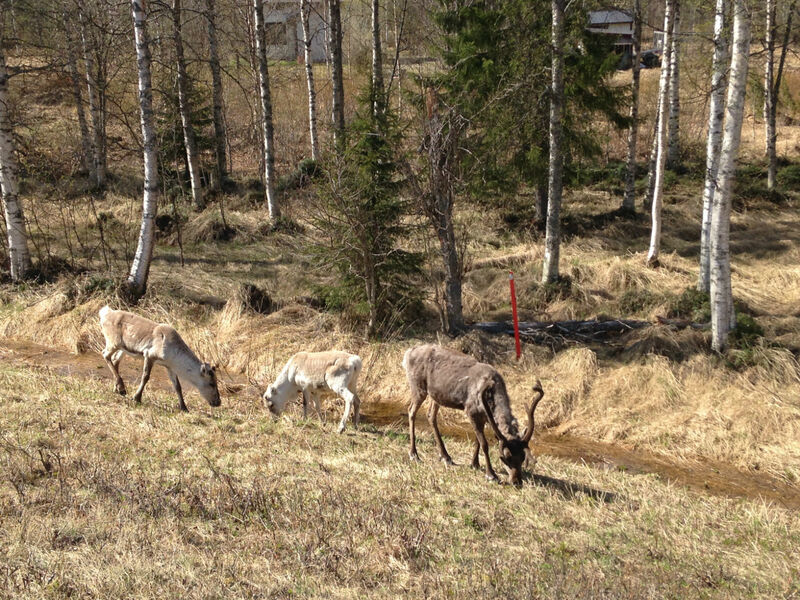 Today we again see reindeer along the roadside. 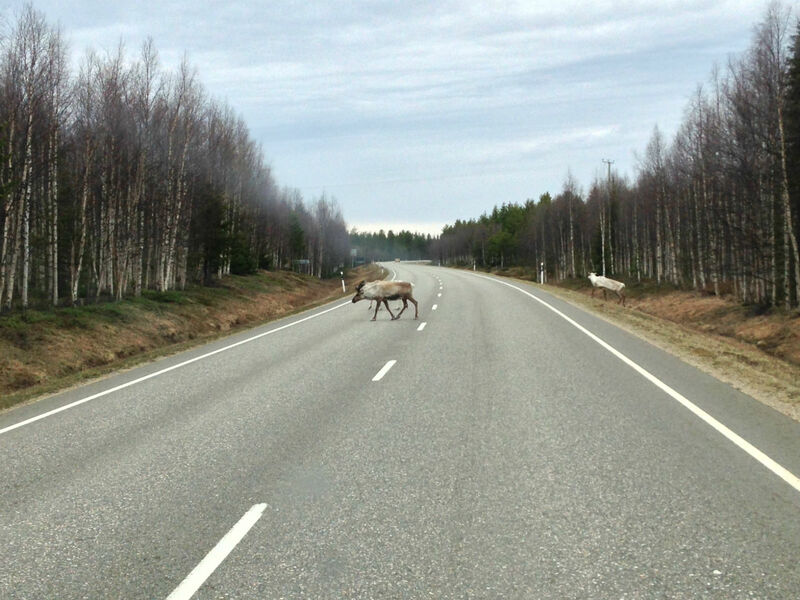 Our travel guide had already “promised” that we would, as in it was written, that it is almost impossible to drive through Lapland without encountering reindeers; eventually, there are more reindeer than people. It was right, because throughout our tour we see many. 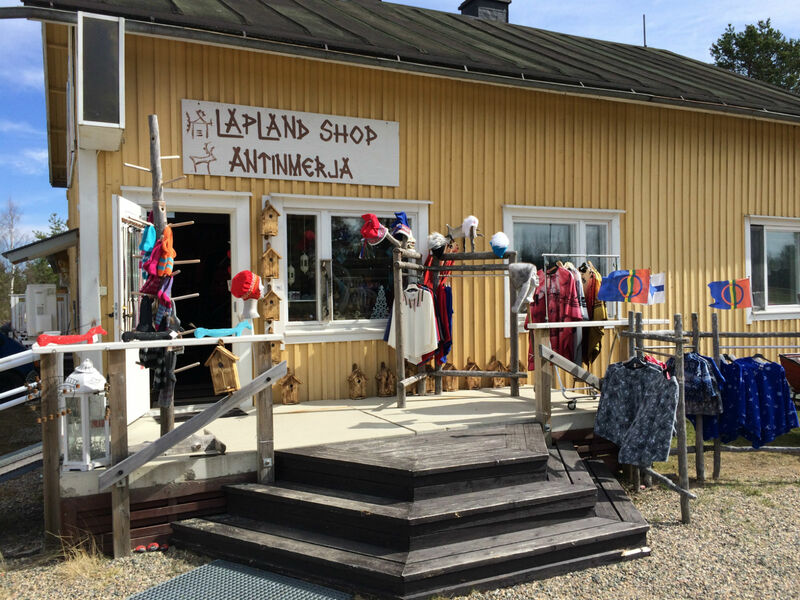 At a small souvenir shop, the nice owner explains that there are currently a lot of mosquitos and the clever reindeer therefore stand at the roadside, so that the wind from the cars blow the mosquitoes away. 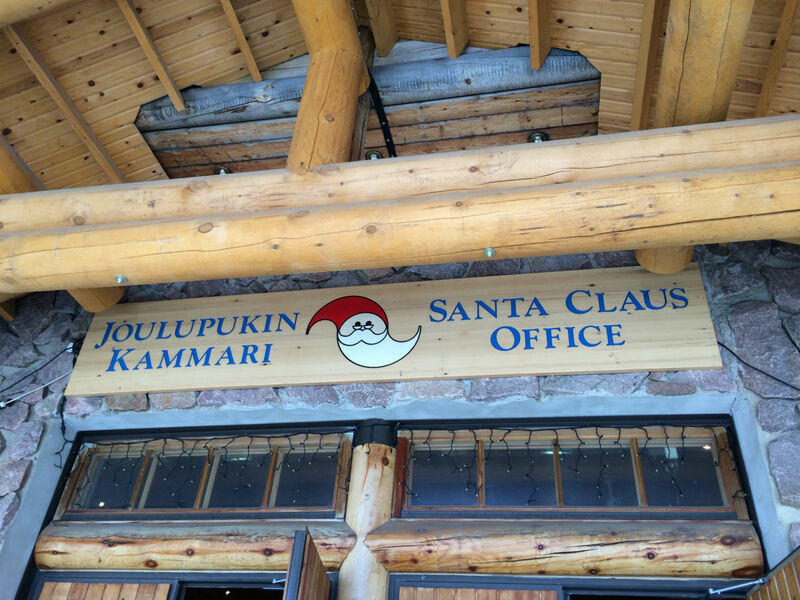 We buy a Lapland mug for our collection, chat a bit and continue on. 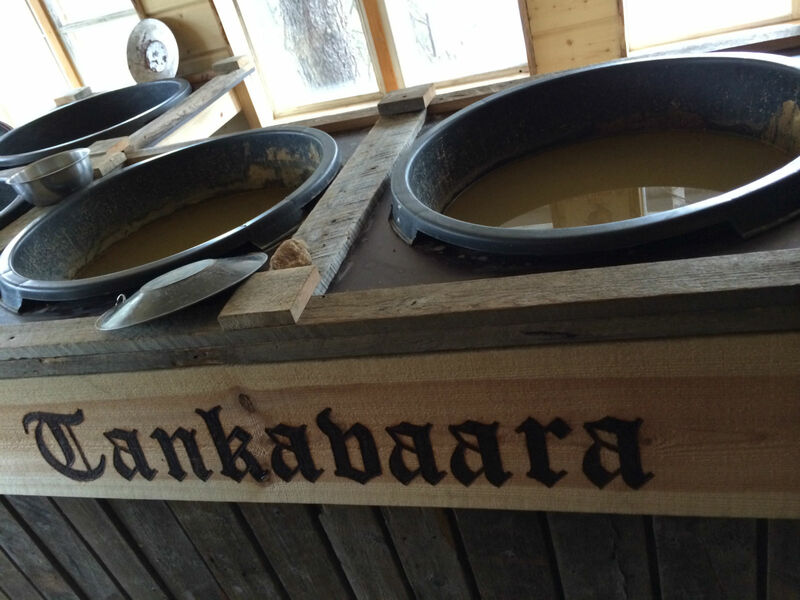 In Tankavaara we want to try our luck as gold miners. 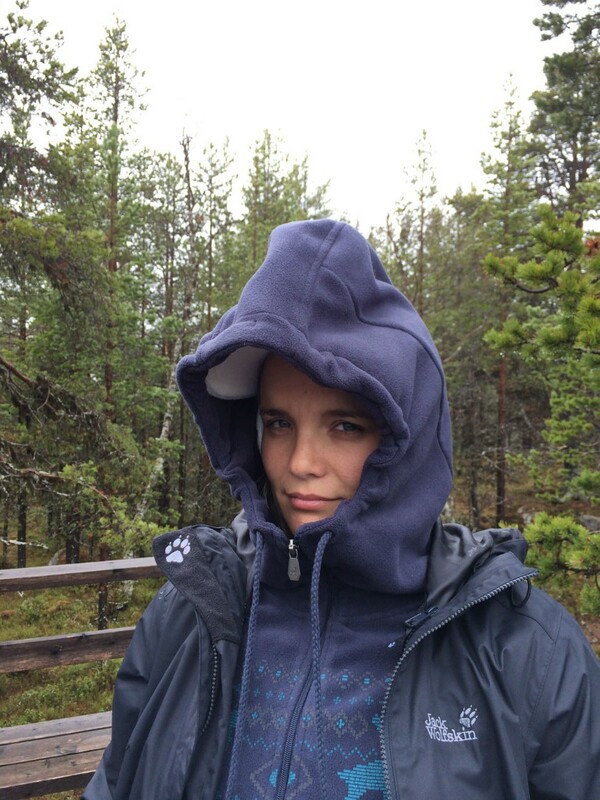 Here again, we feel that it is preseason, because it is too cold to dig in the open air, along the river. 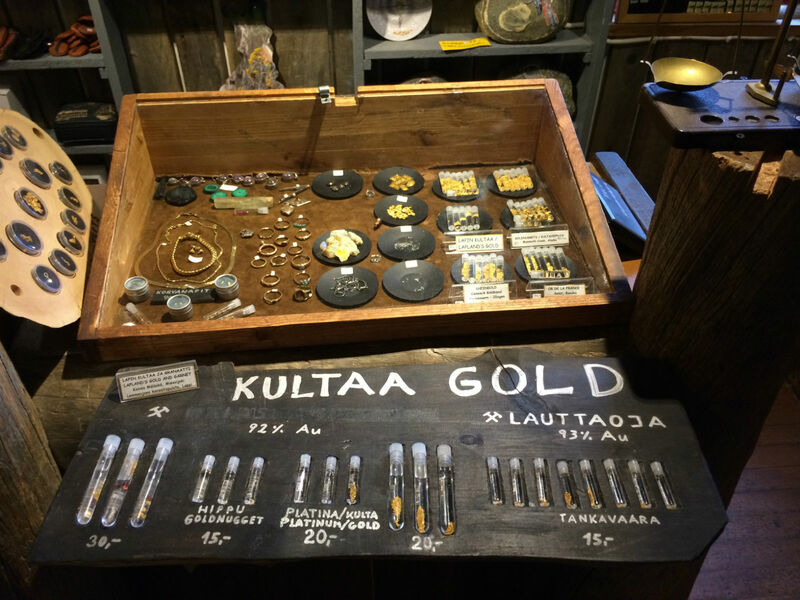 The advantage is that Kasper – one of the owners and geologist – has a lot of time for us and tells us everything about gold and gold mining. 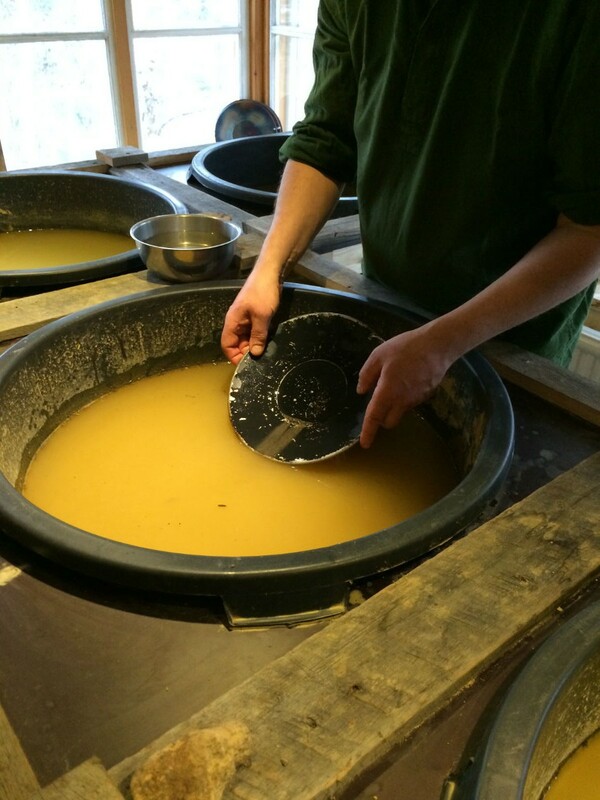 At washtubs the men try, under the expert guidance of Kasper, their luck and promptly have success. 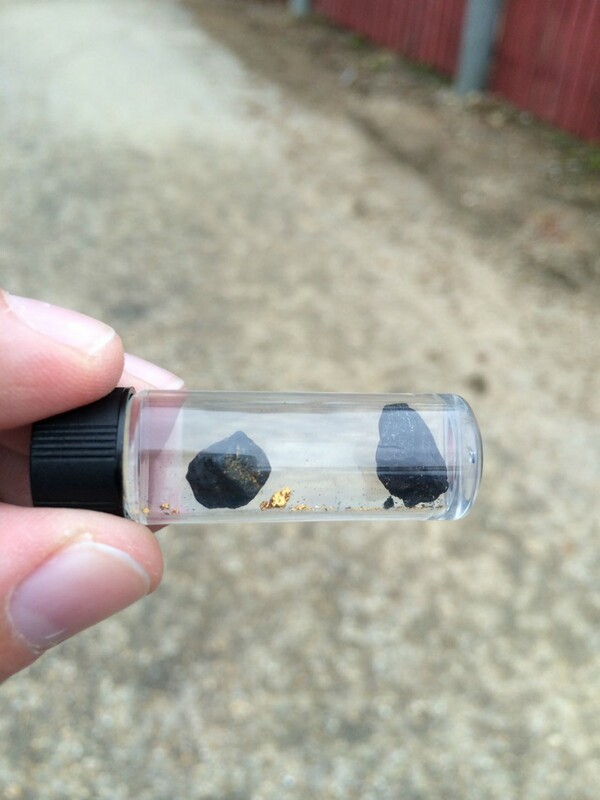 Sven finds a real gold nugget. 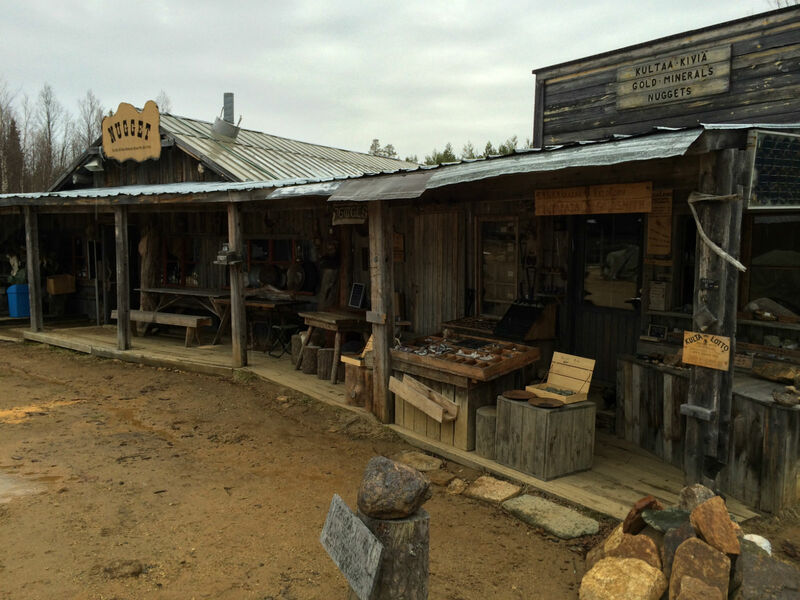 🙂 Although the weather is quite unpleasant, we still explore the vast terrain, which is designed, with much attention to detail, as a western town. 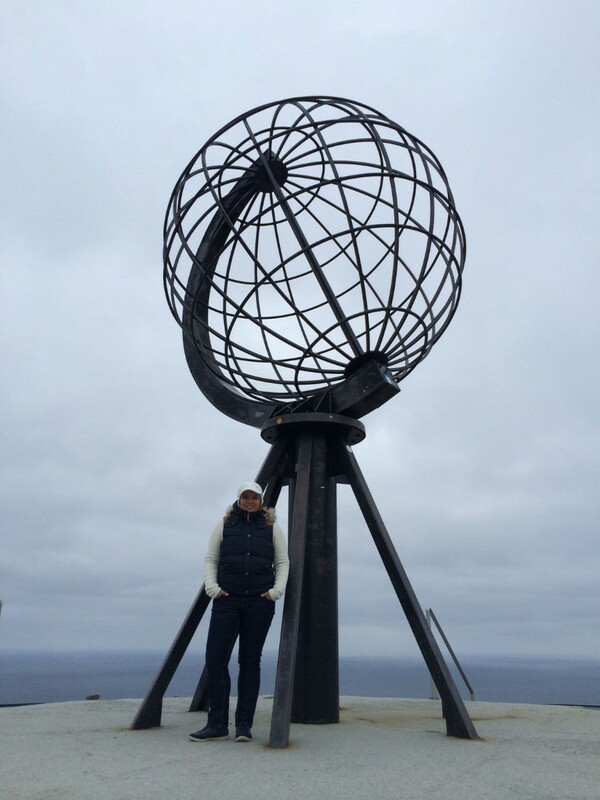 A great experience on our way to the North Cape. The weather gets worse and worse. 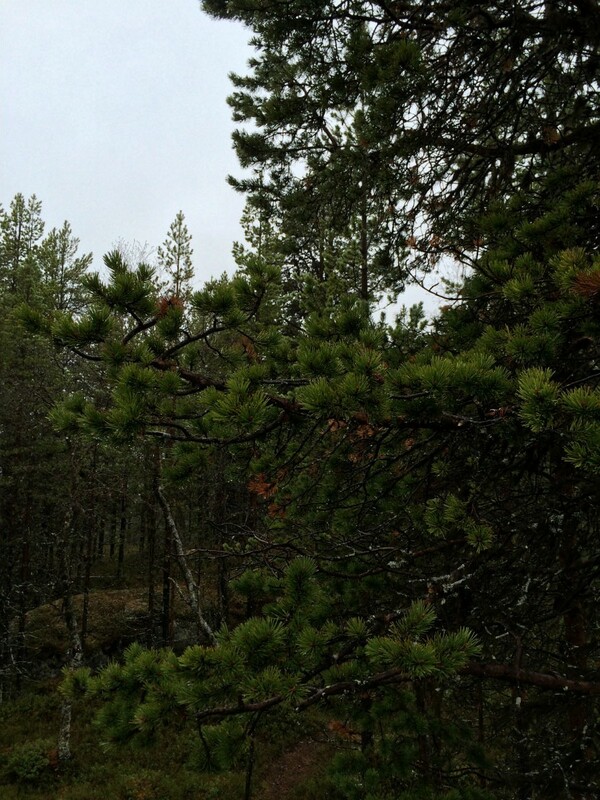 In the rain we continue to Inari, there it is already really cold. The campers’ heater is our best friend for the next few days. We look for a campsite right on the lake, not that it actually matters with weather like this. The owner of the campsite recommends Hotelli Inari for dinner. 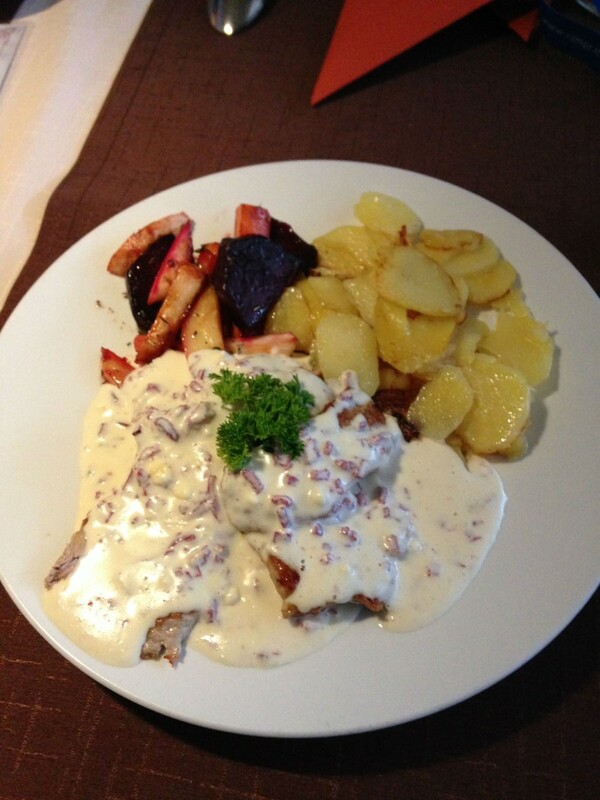 We order salmon and reindeer and the good food makes up a little for the bad weather. 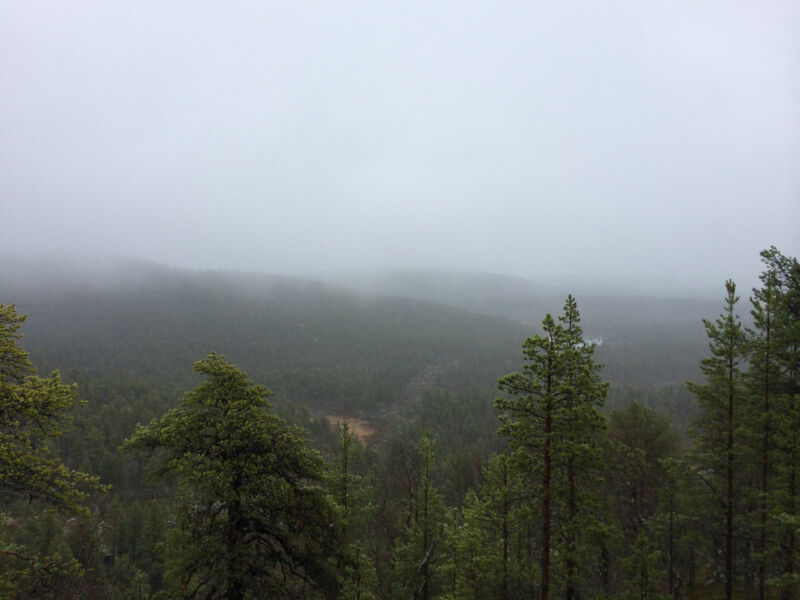 23 May, 2014 – Rain, rain, rain. 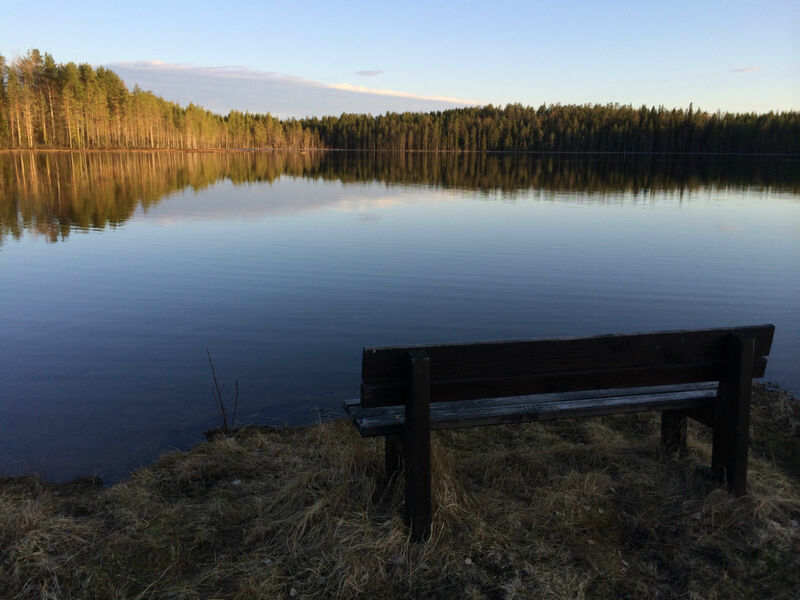 This is a real pity as the third largest lake in Finland, with its thousands of islands and pine forests, is to be a highlight on the way to the North Cape. 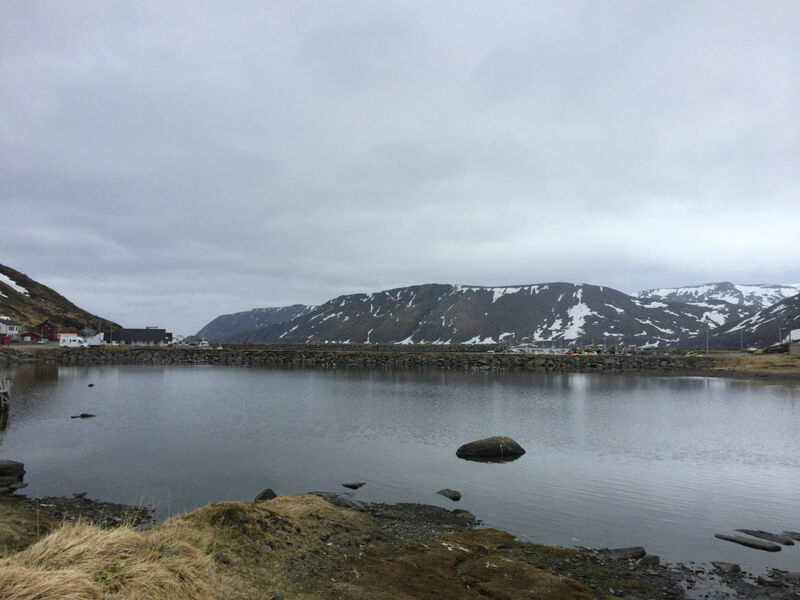 Apart from the rain, the planned boat tour also comes into question, because the lake is still partly frozen and not even the ships are able to drive. 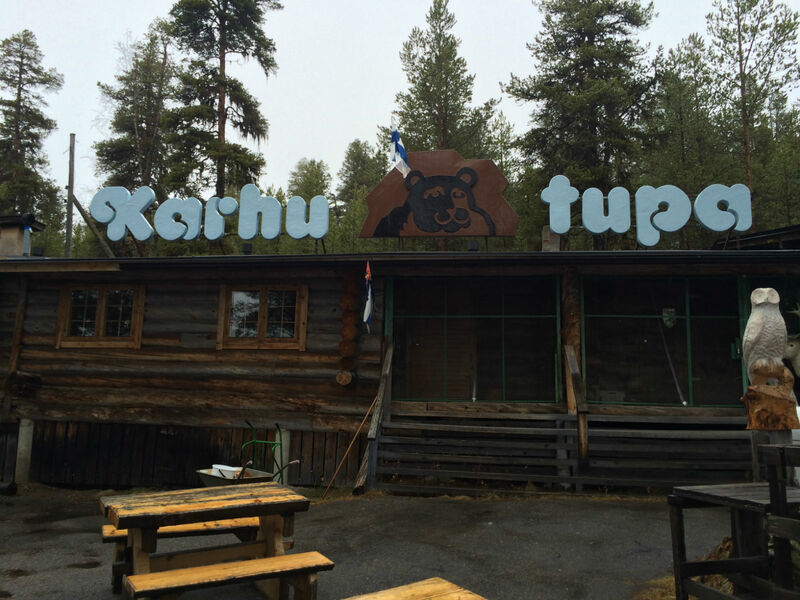 We drive the E75 just under 15 km back to Karhutupa (Bear Cabin). 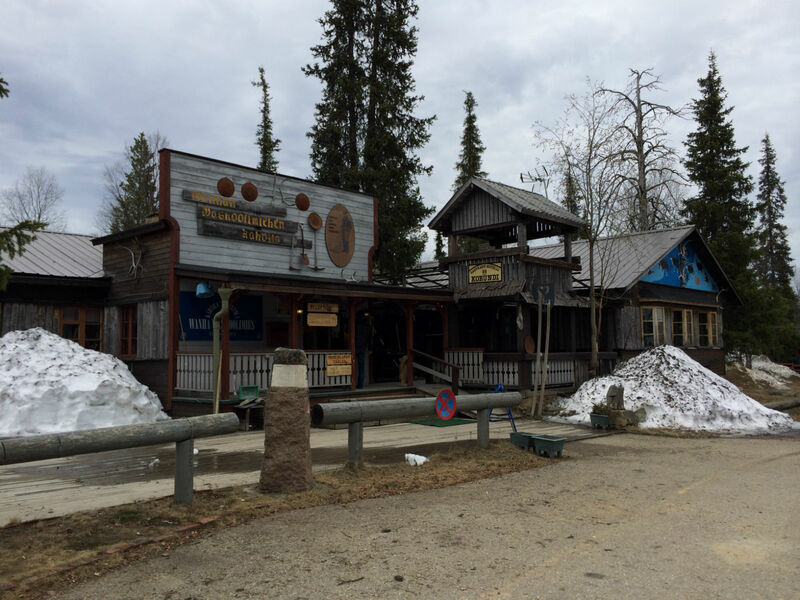 Fresh smoked salmon is supposed to be sold there. 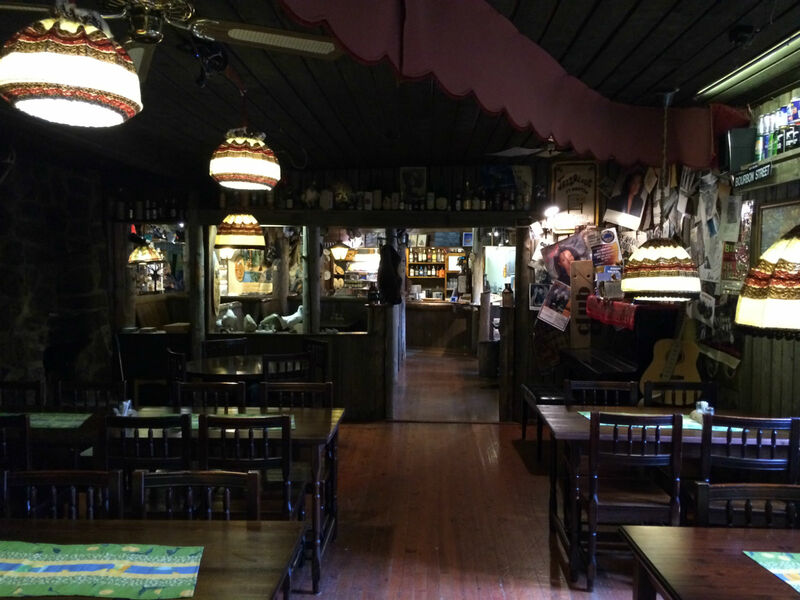 We are unfortunately one week too early, the salmon smokehouse is still closed. 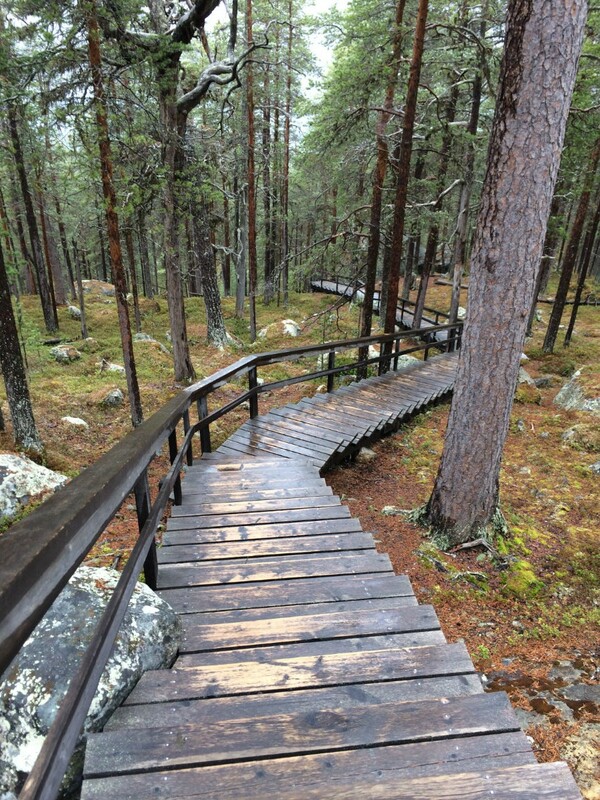 🙁 We still take the few stairs up to Bear Cave and the further steps to the lake. 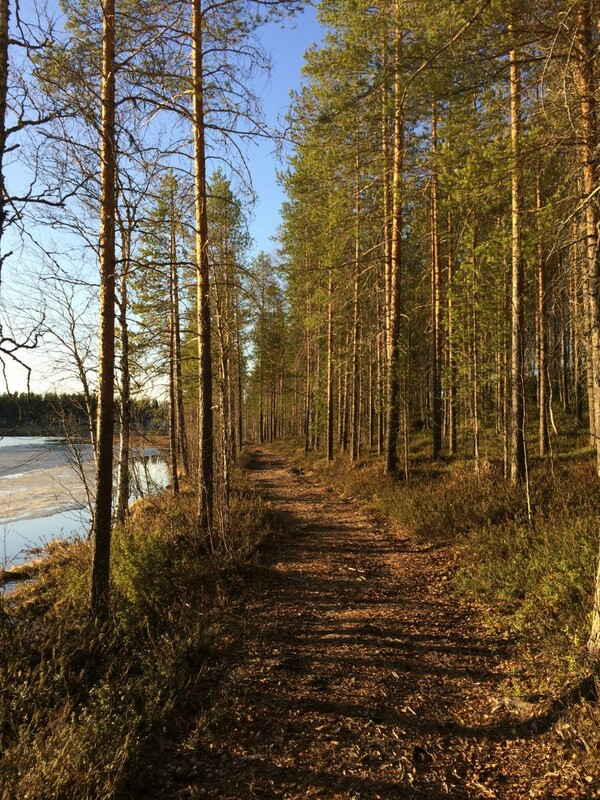 The route is not really worth it, but there is not much else to do anyway. 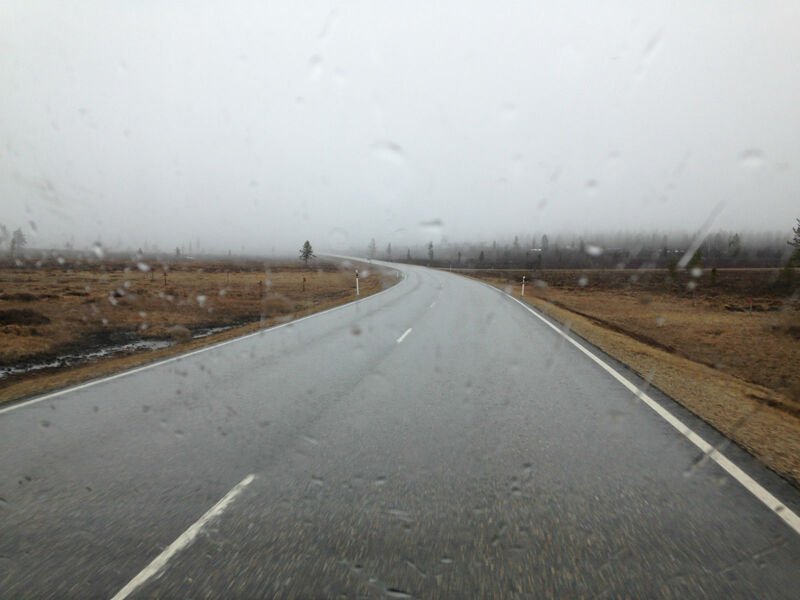 Since the weather is not going to get better, we choose to turn our back on the Inarisee and continue on our drive towards Norway. 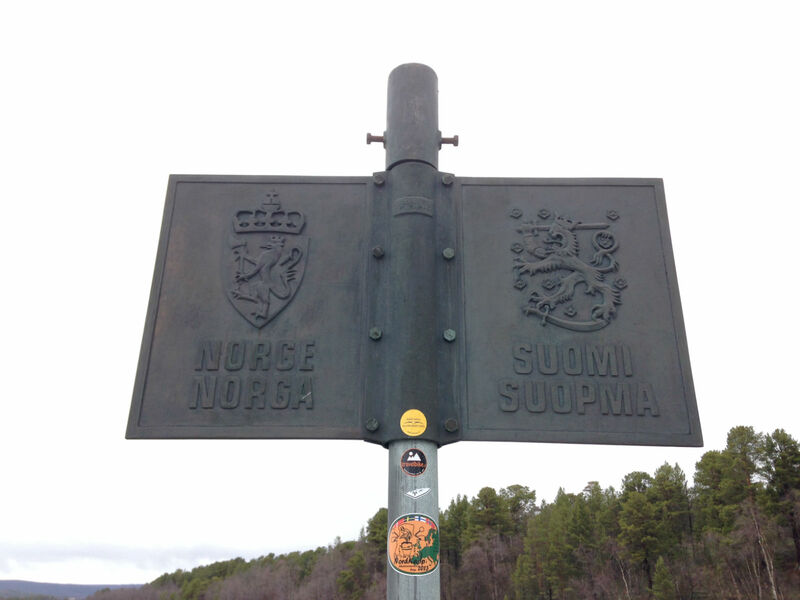 We have to drive pass a few campsites before we find a place to stay close to the Norwegian border. We spend the evening comfortably in the camper, play cards, listen to the baby monitor and are full of anticipation for the North Cape. 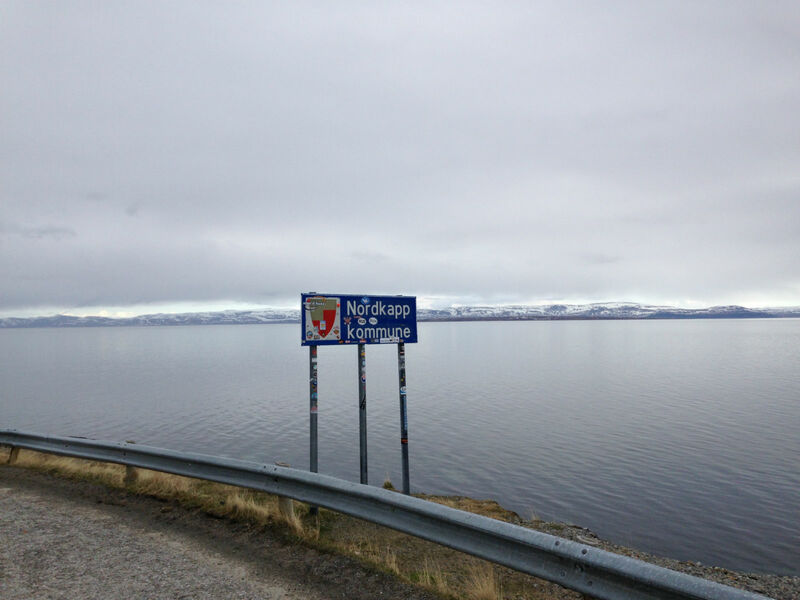 24 May, 2014 – We are in Norway! Our destination is getting closer. 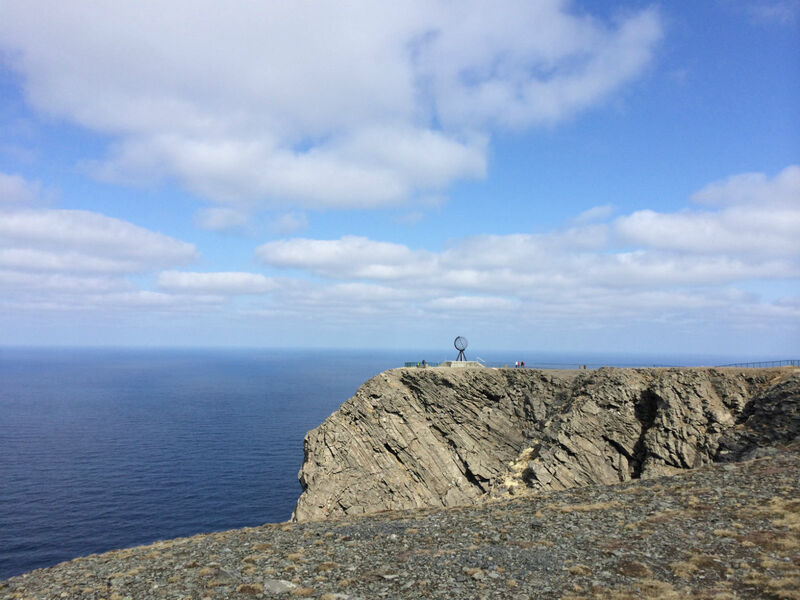 What is the first thing we do in Norway? 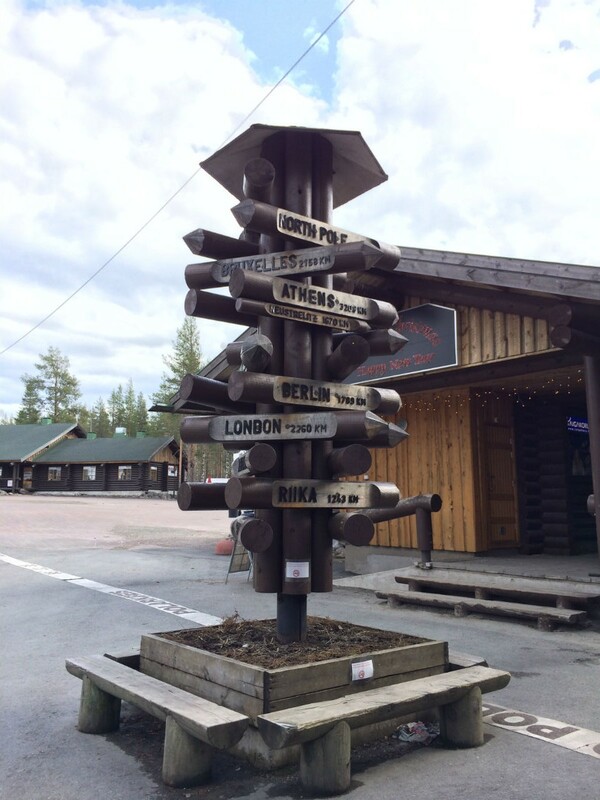 Exactly, we get ourselves, in Karasjok, a prepaid data card. This time it is not quite as simple, but we are persistent. 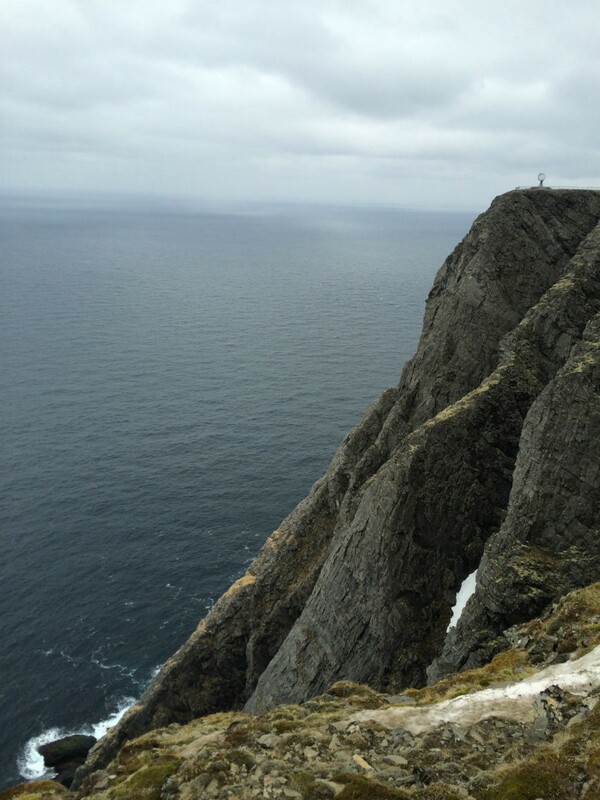 Tips on “Mobile Internet in Norway” you can find in the link above. We drive the E6 north and the weather starts getting better. 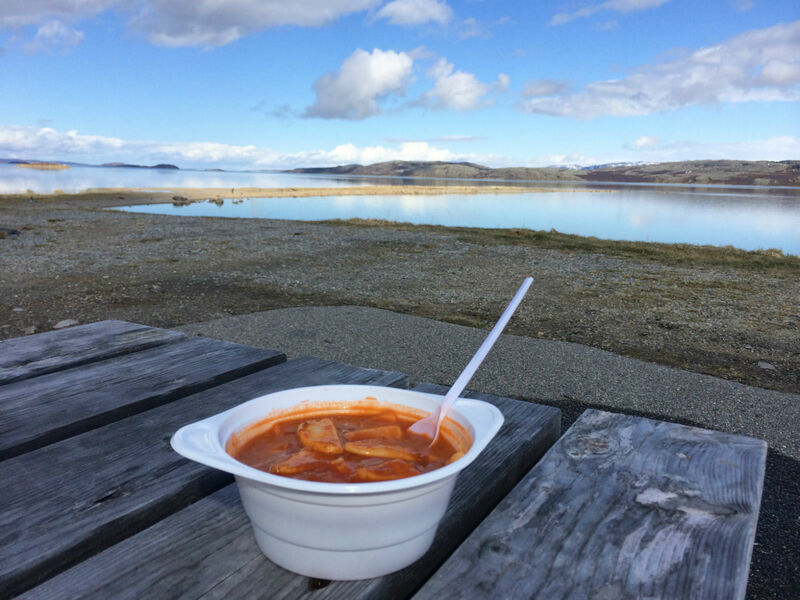 When we reach Porsangerfjord, the sky beams and we decide to have something to eat here and enjoy the sun and wonderful view. 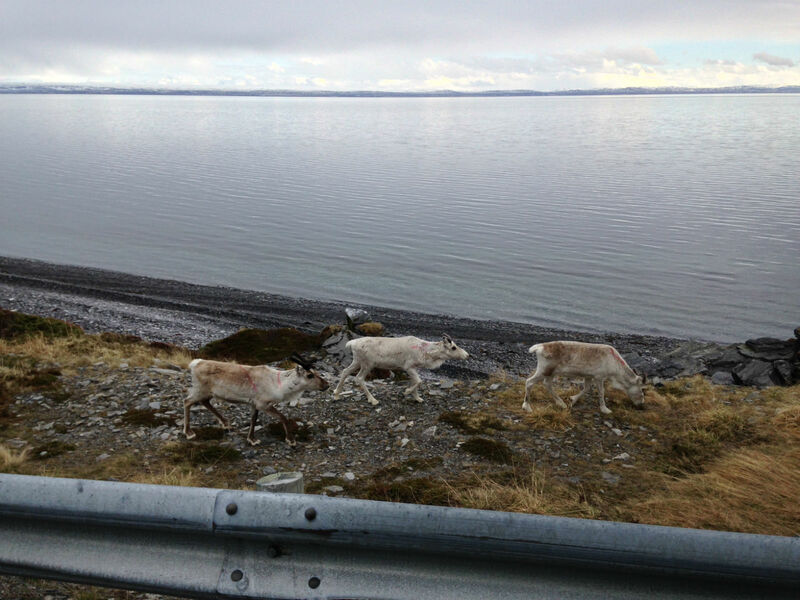 During the drive on, we enjoy the great scenery. Rough rocks, mirror-like water, fishing boats and small wooden houses on the shore. Beautiful. 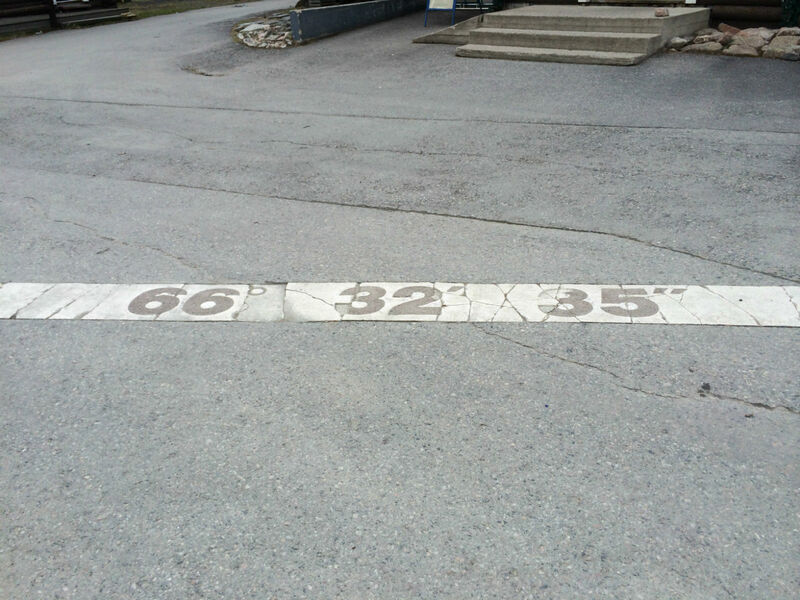 We meet the E69, in Olderfjord, that will lead us to the North Cape, to be more precise, directly to the Nordkapp Camping site. 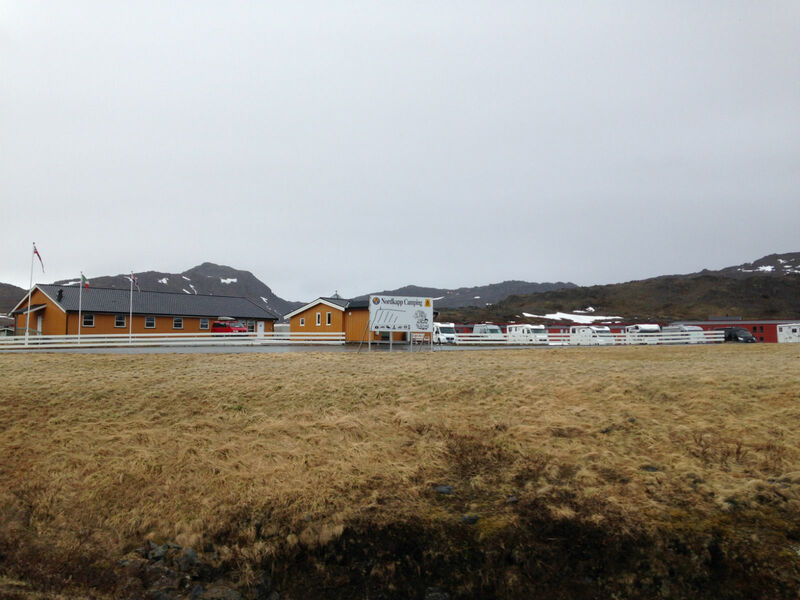 As that is where we will be staying, before we finally head to the North Cape the next morning. 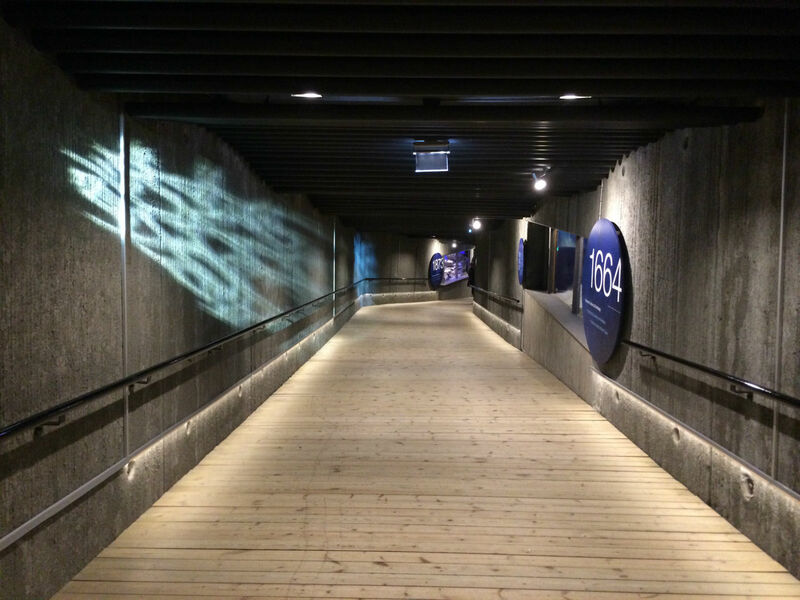 We read in advance about the narrow streets and tunnels on the way to the North Cape, where even the best nerves are put to the test. We do not share this feeling. The roads and tunnels are well developed, and even with our campers, we make it through and at no time did we feel that it was really tight. 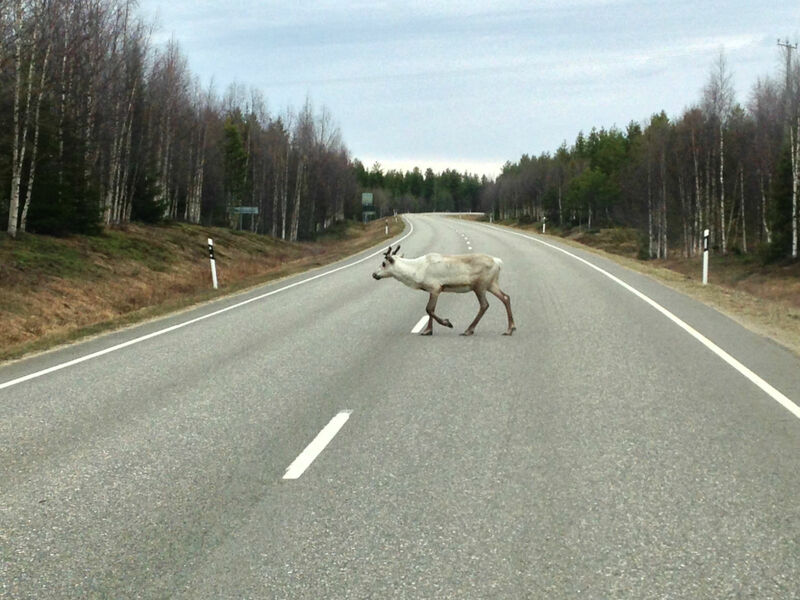 The only dangerous things were the many reindeer, who also sometimes run uncontrollably on the road. 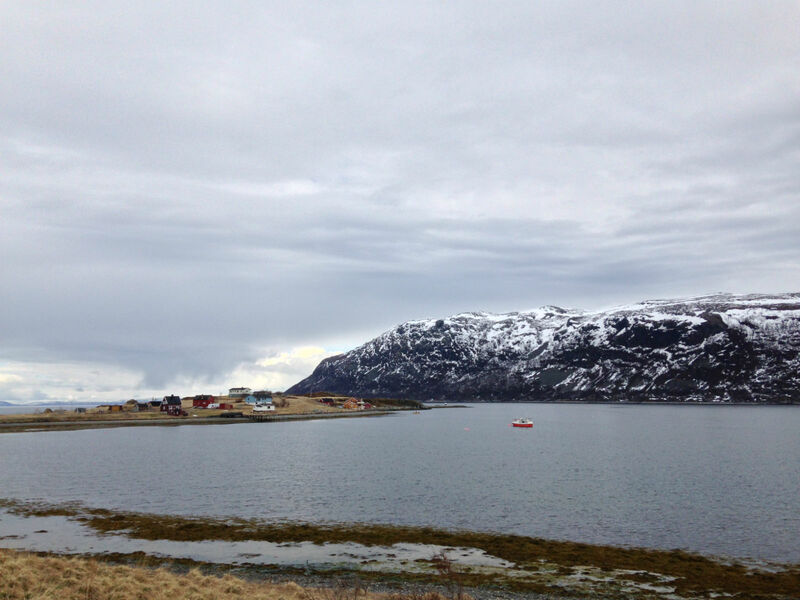 In Honningsvåg we stock up again with food. 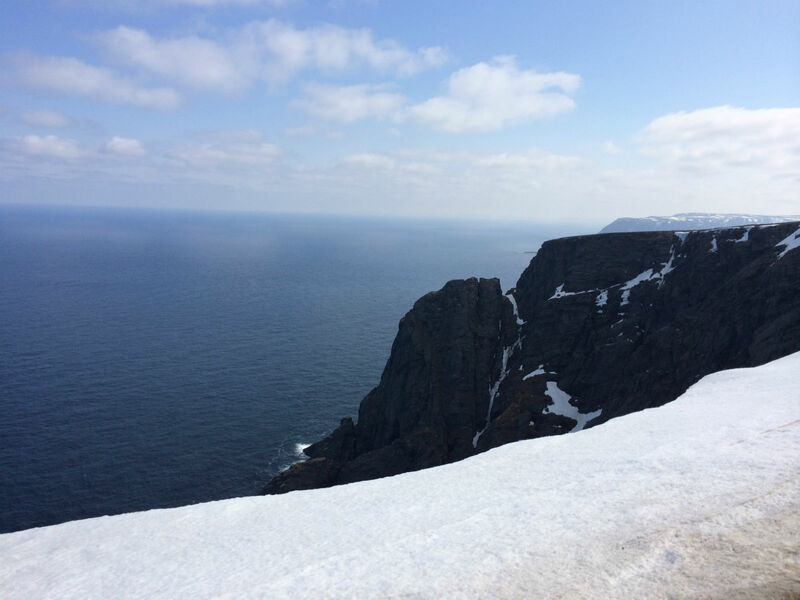 Then we reach the Nordkapp Camp site. Of course, it is not really cheap. 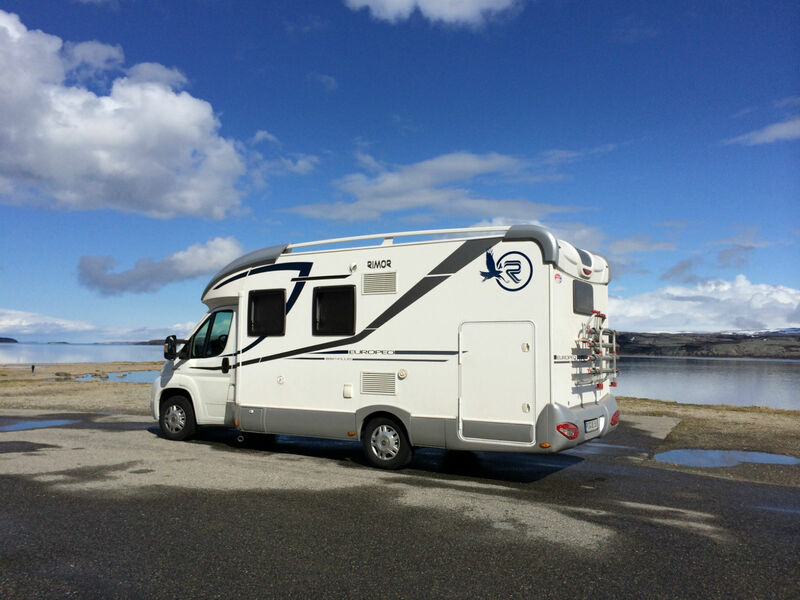 With nearly 40 euros per space, we pay twice as much as the most expensive campsite on our whole trip so far. Here we do all our cleaning and refilling, as we may not have access to camping facilities for the next few days. 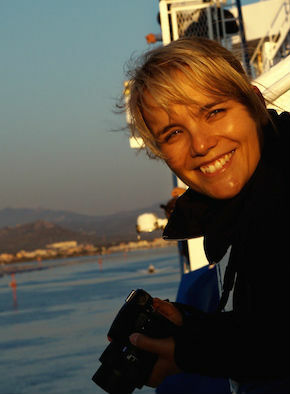 We get a few tips from a staff member. 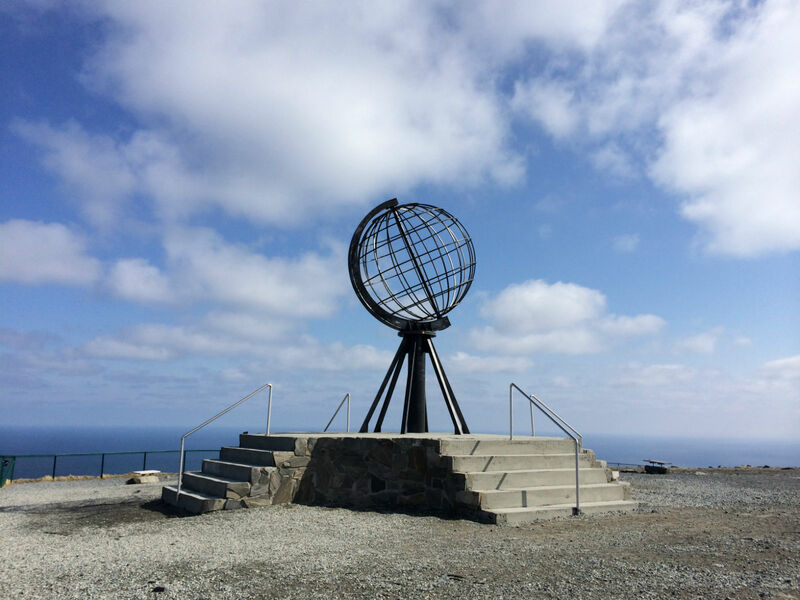 We only need to buy a 12-hour ticket at the North Cape and can stay as long as we want, because in the preseason there will be no check. 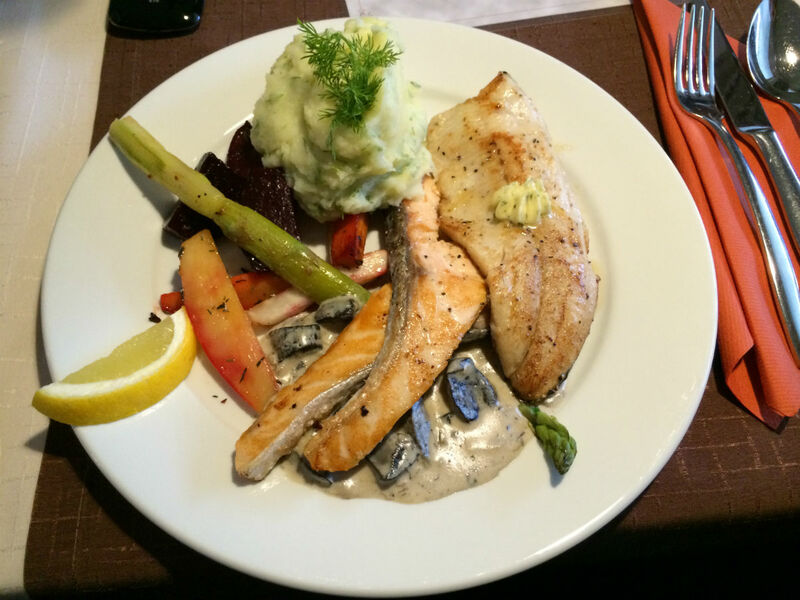 We should also, on our return trip, visit the Café Corner in Honningsvåg, as delicious fish is served there. 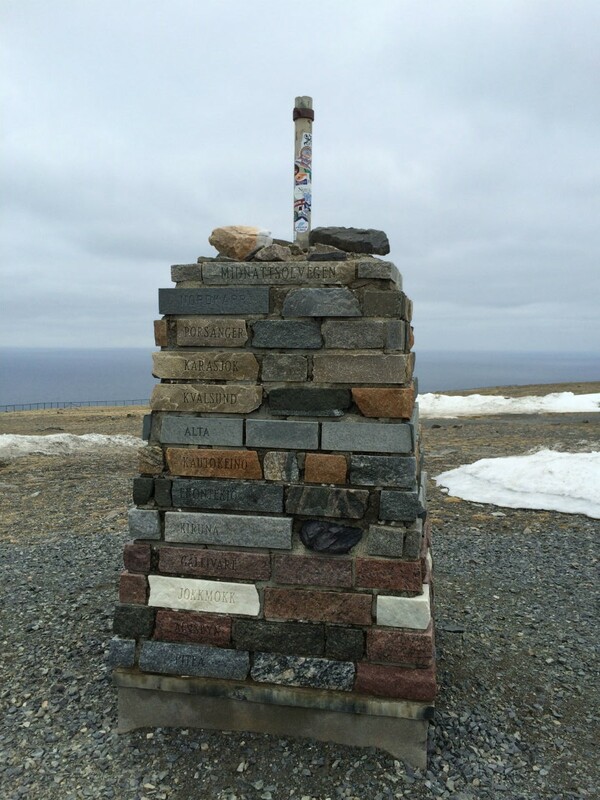 25 May, 2014 – After a cold night the time has come. The sky is overcast and it is also quite foggy. 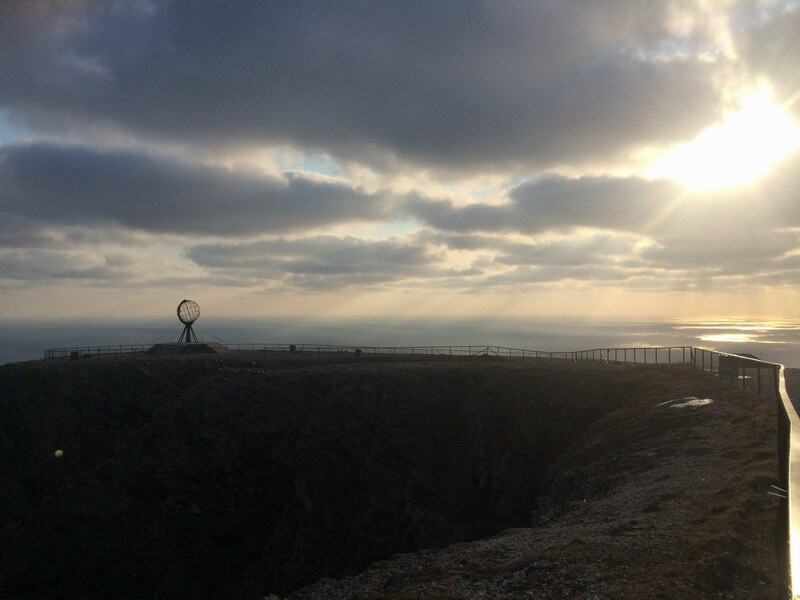 We fear the worst as fog at the North Cape is not uncommon. 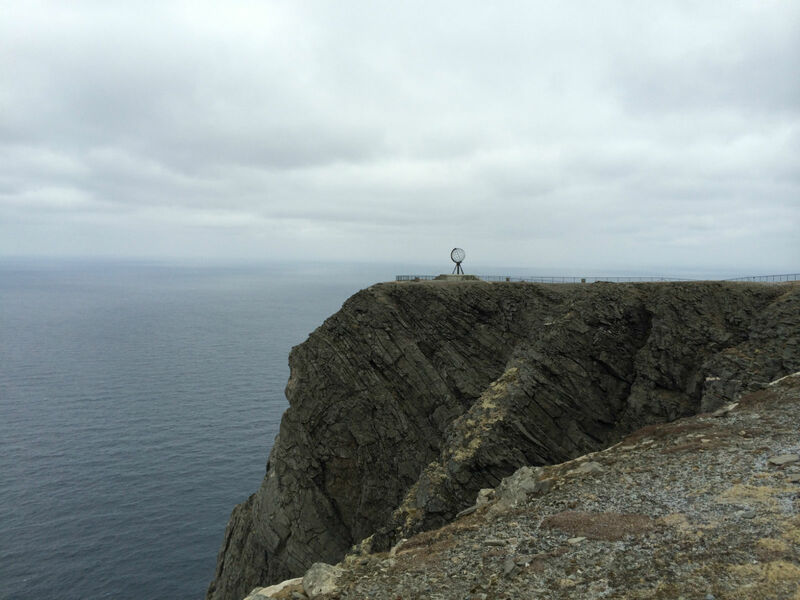 We would not be the first to travel the long route to the northernmost point of Europe, only to see nothing. 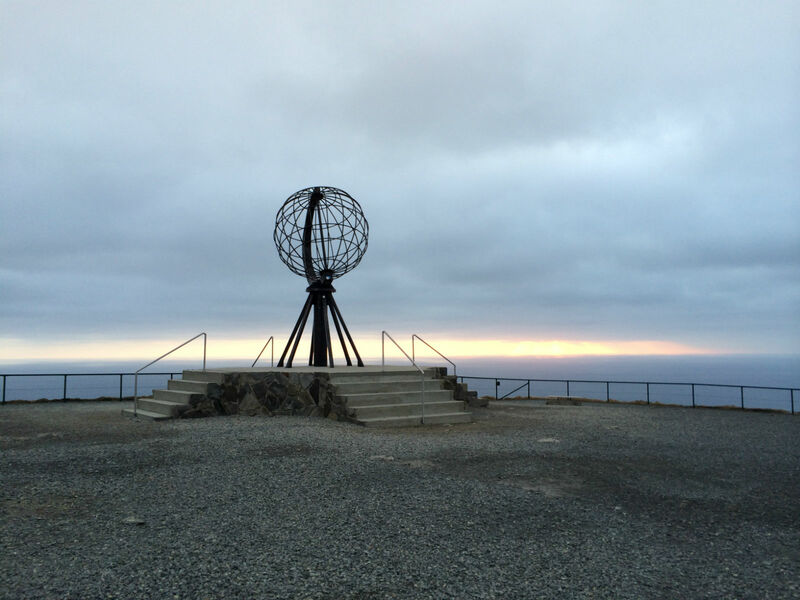 From Nordkapp Camping it is still another 25 kilometers. 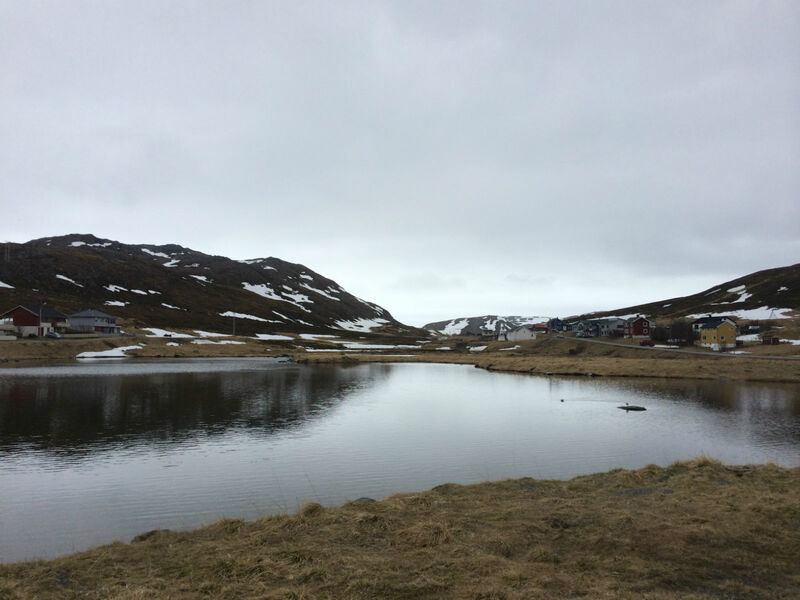 We also make a short trip to the small village Skarsvåg – probably the most northern fishing village in the world. 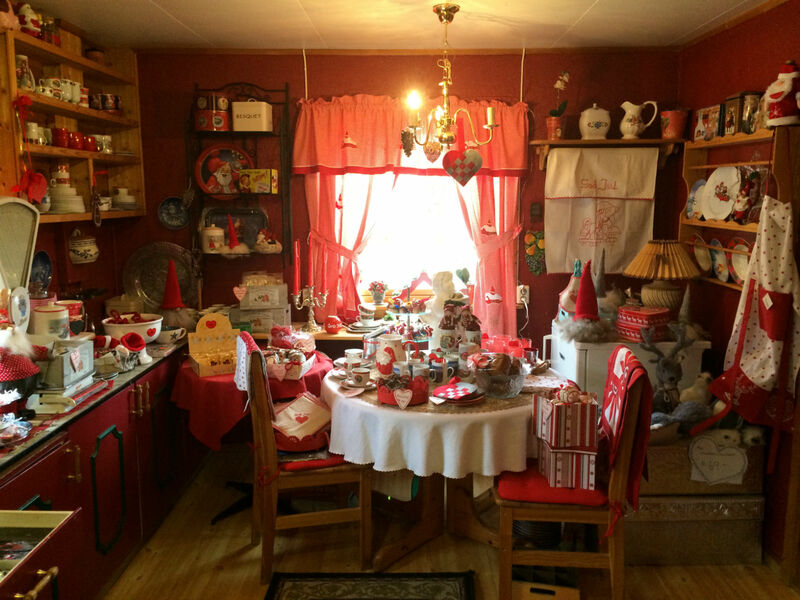 There is a small and cozy café that also sells Christmas souvenirs. In brochures it is advertised as a Christmas house, but you should not expect too much. 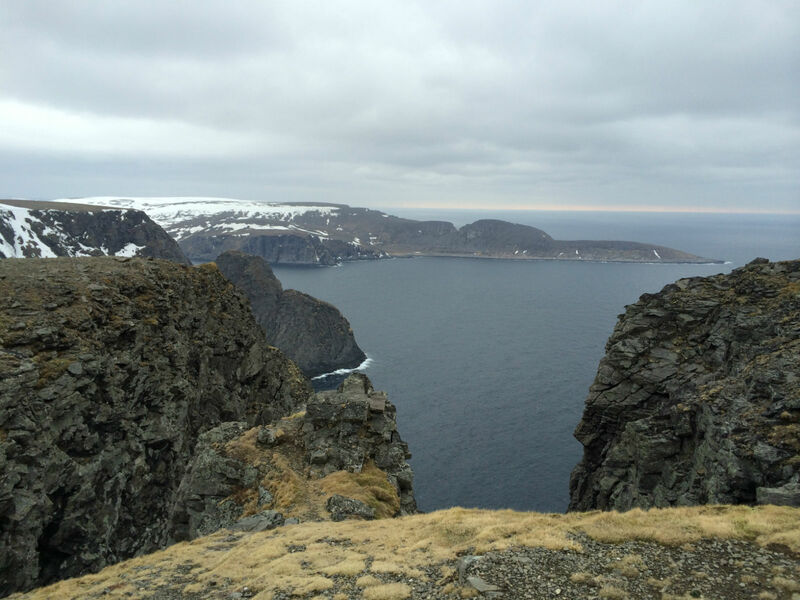 Nevertheless, the brief detour was worth it and later in the North Cape cinema we recognize Skarsvåg. 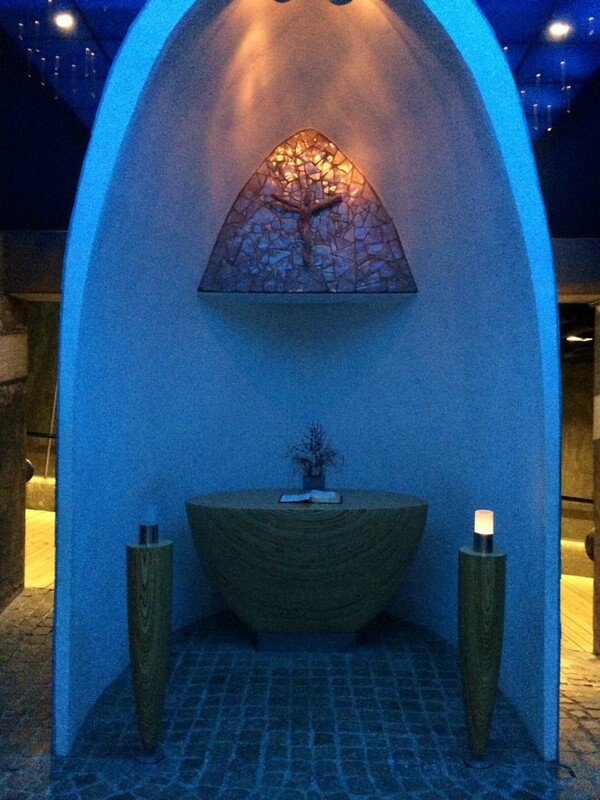 We then warm ourselves on the spacious visitors’ center. Which is really very nicely laid out. 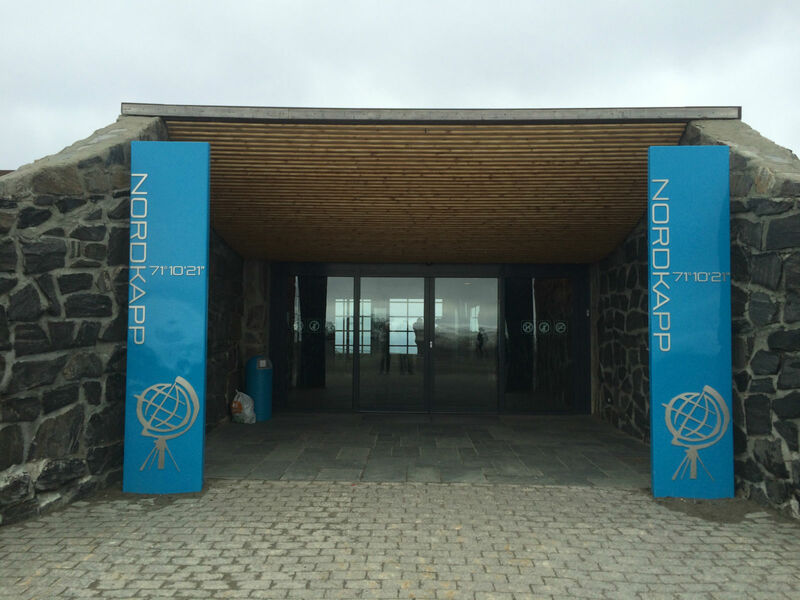 In the North Cape cinema, a 15-minute film runs, showing the seasons and life at the North Cape. 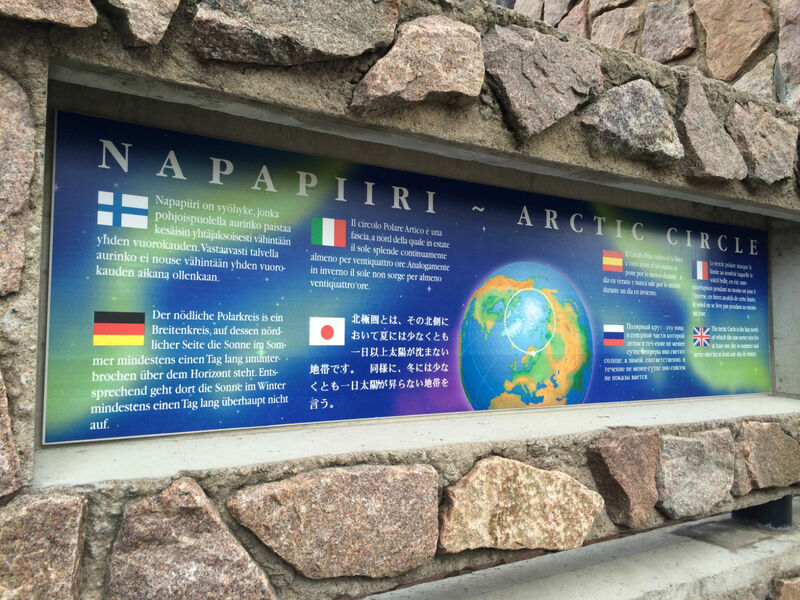 A walk with information panels leads pass the North Cape chapel to the Cave of Lights – a light show. 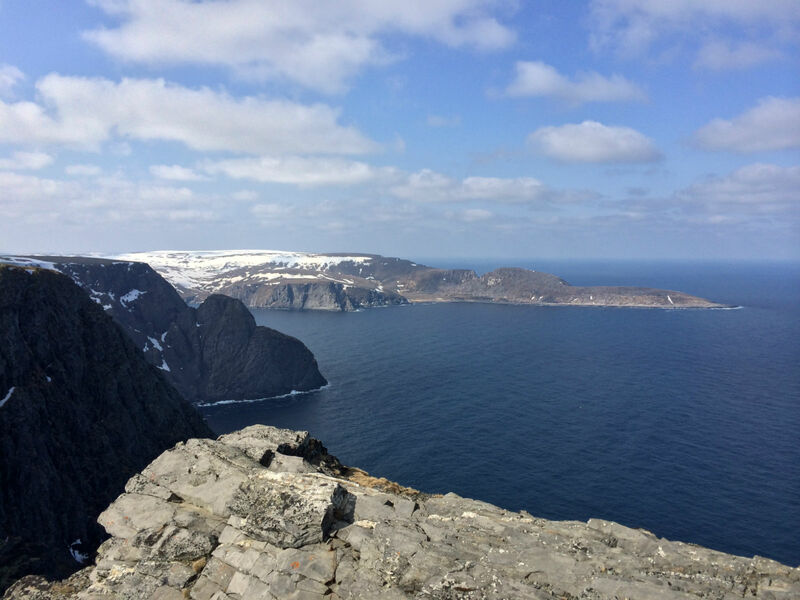 Next to a restaurant there is also a small café and a large North Cape shop. 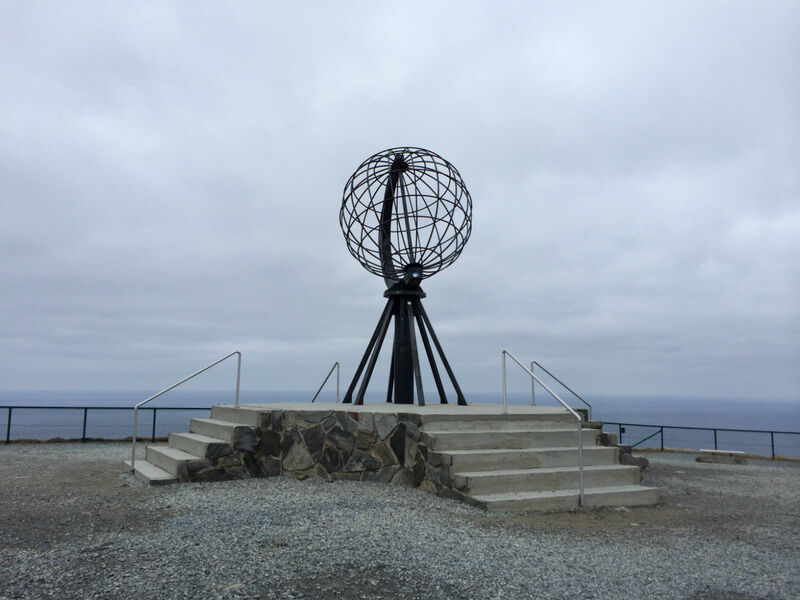 We have read in advance that it would be cheaper to buy souvenirs of the North Cape not directly at the North Cape. 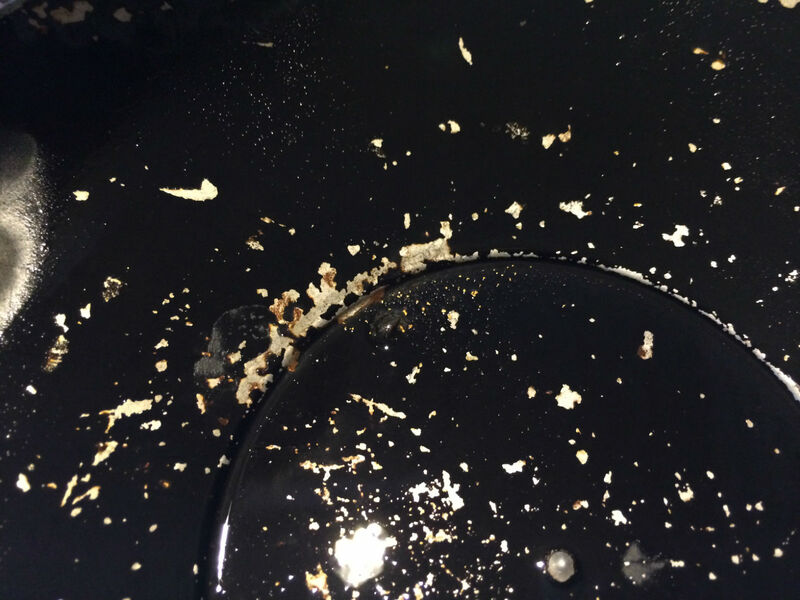 We did not have this experience. 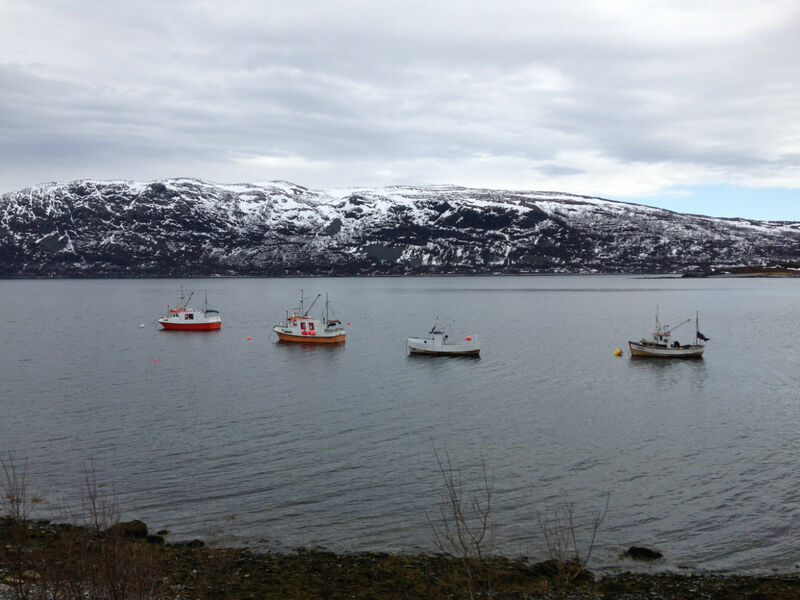 The selection is huge and we didn’t find the prices to be more expensive than, for example, in Honningsvåg. 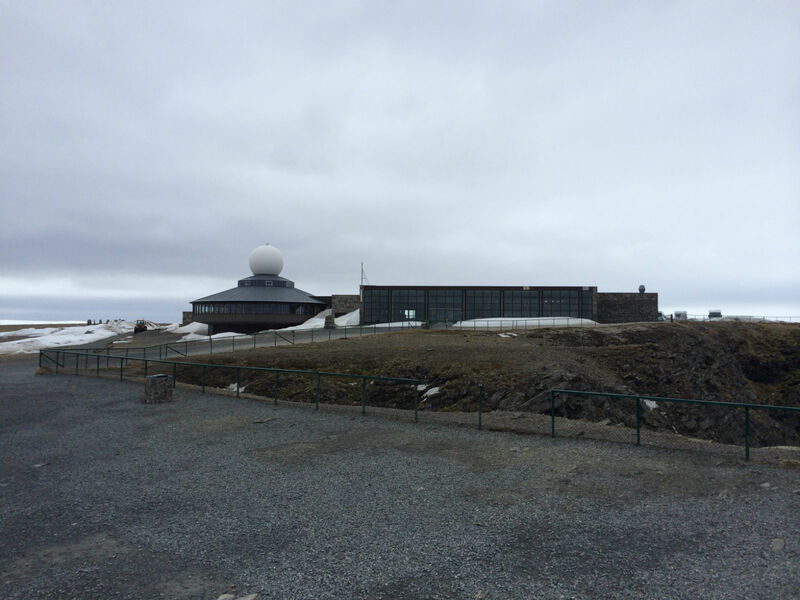 In the evening we sit in the cafe at the visitor center – which is open until 1am – and use the free Wi-Fi to work. We are almost alone here. 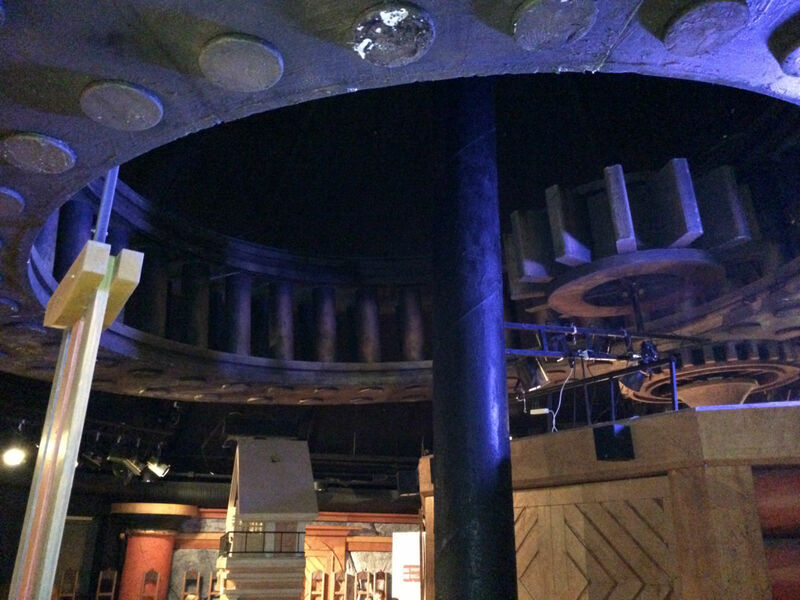 Facing the Globe, we enjoy the midnight sun. 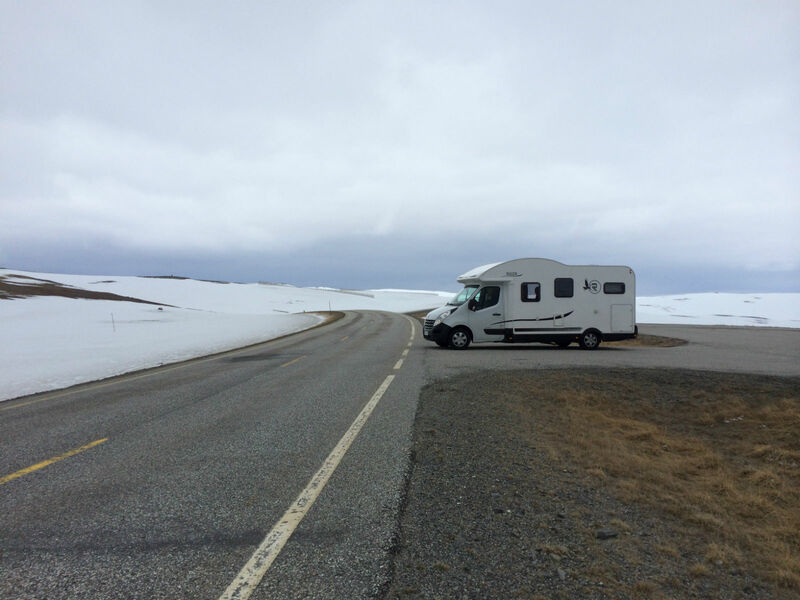 26 May, 2014 – In temperatures below zero, we spend a freezing, bitter cold night in the camper; but would do it again. 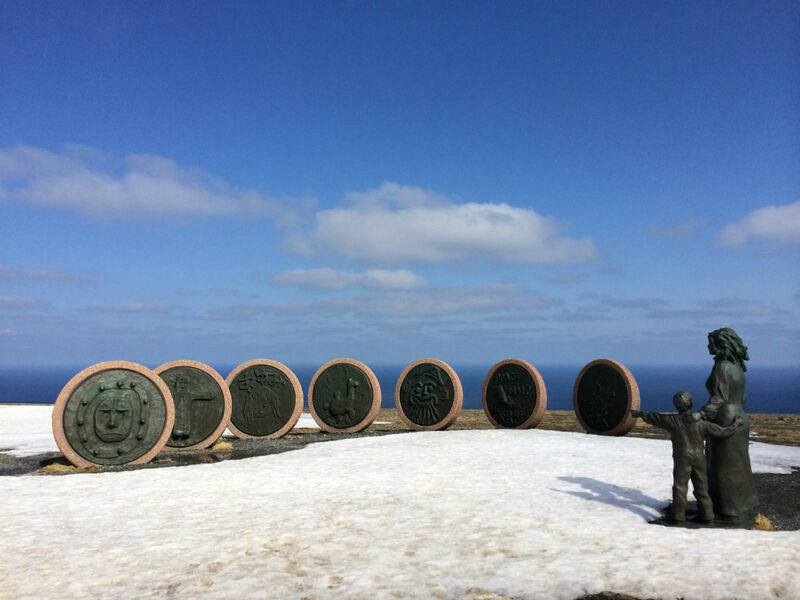 The North Cape is the right destination for a camper tour and thanks to it being preseason, visitor quantities are limited. Plus, the sun is shining! 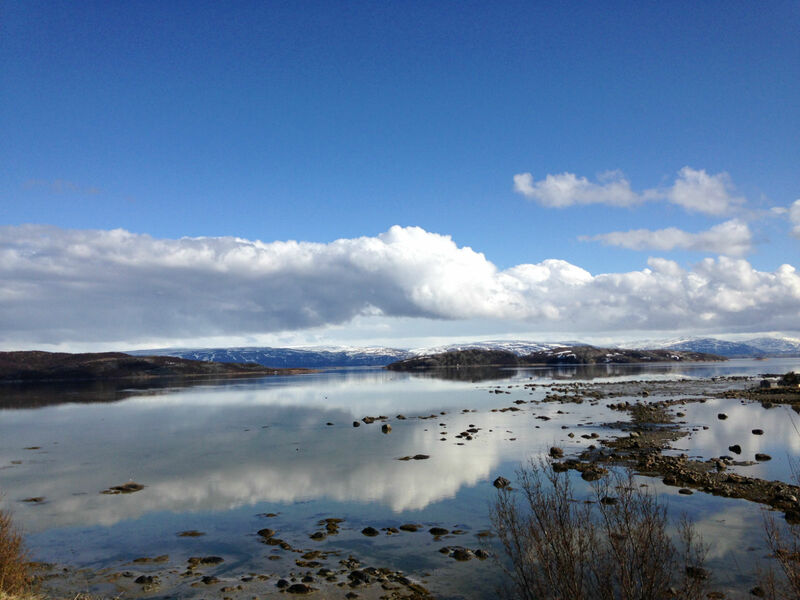 In the morning, several Hurtigruten buses arrive. 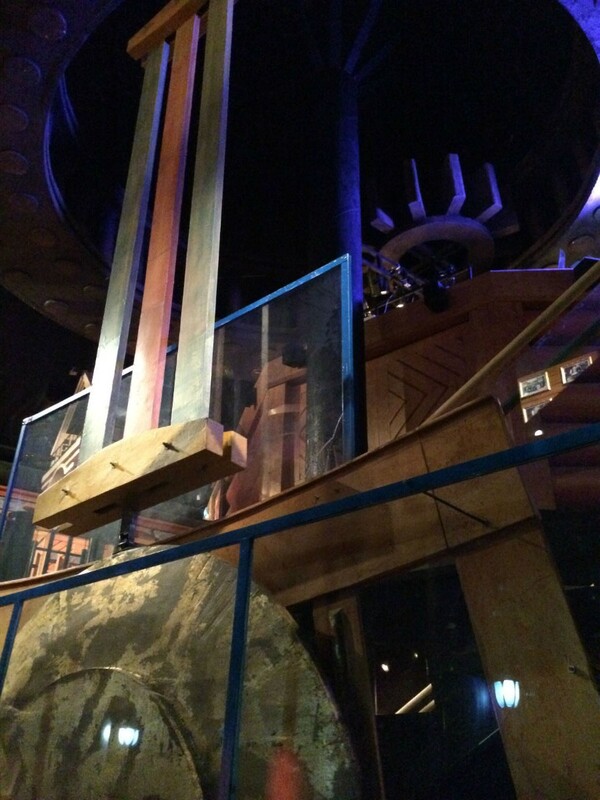 People snap their quick photos at the globe, rush rapidly through the gift shop and then already need to leave. We have it much better. 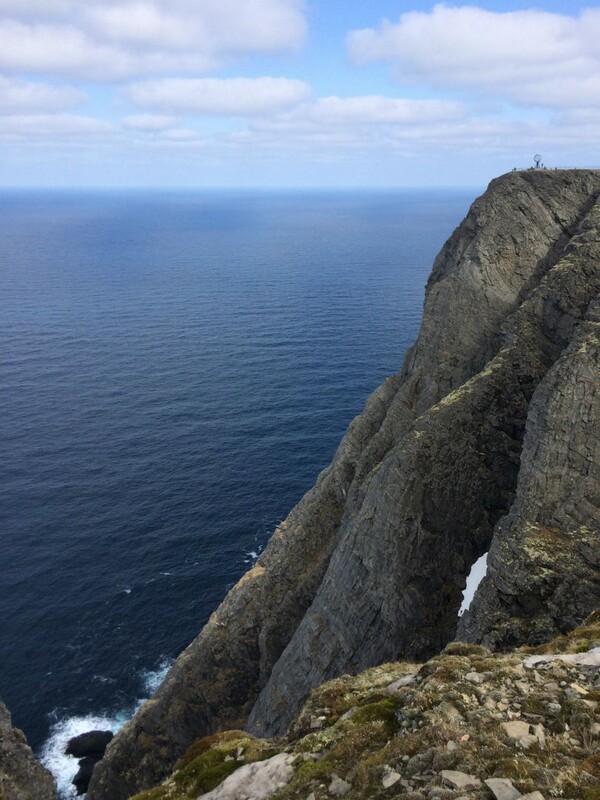 We explore the surroundings and can take time to enjoy the unique landscape at the northernmost point of Europe. Then we say goodbye. 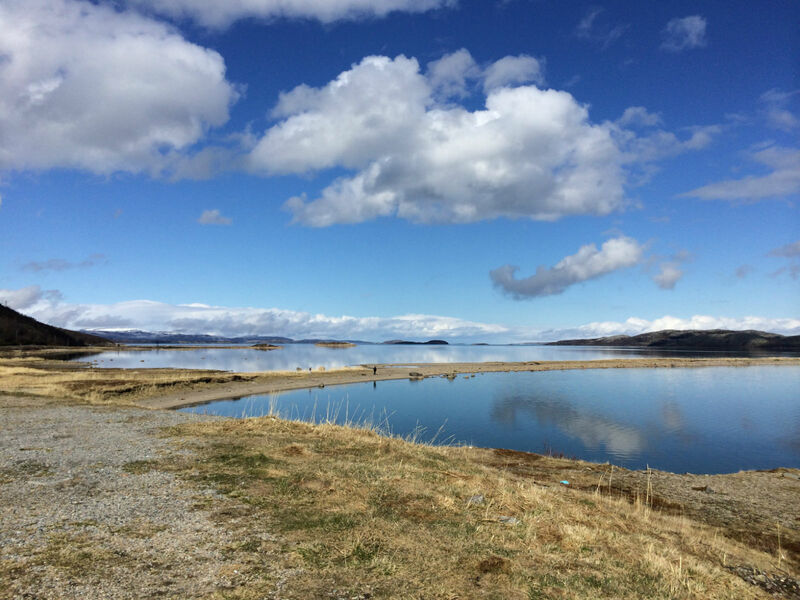 The return journey through Norway over Lofoten, with stops in Trondheim and the Geirangerfjord can be found in part 3 of our journey.